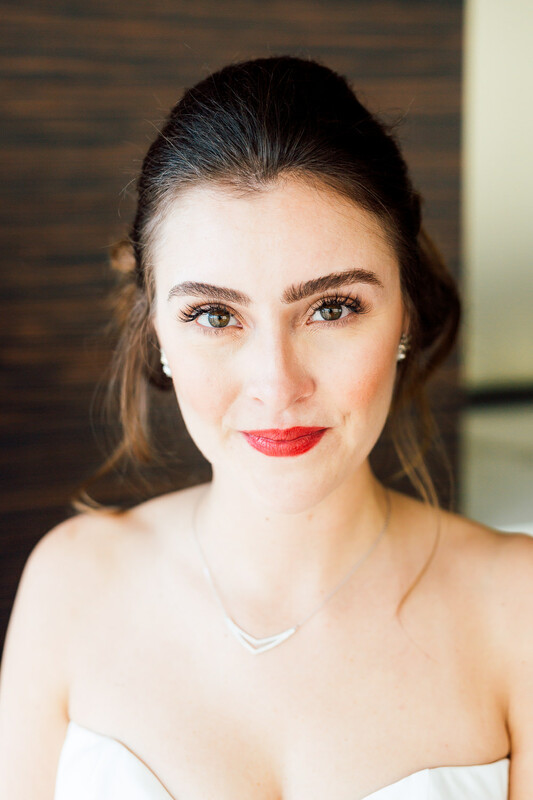 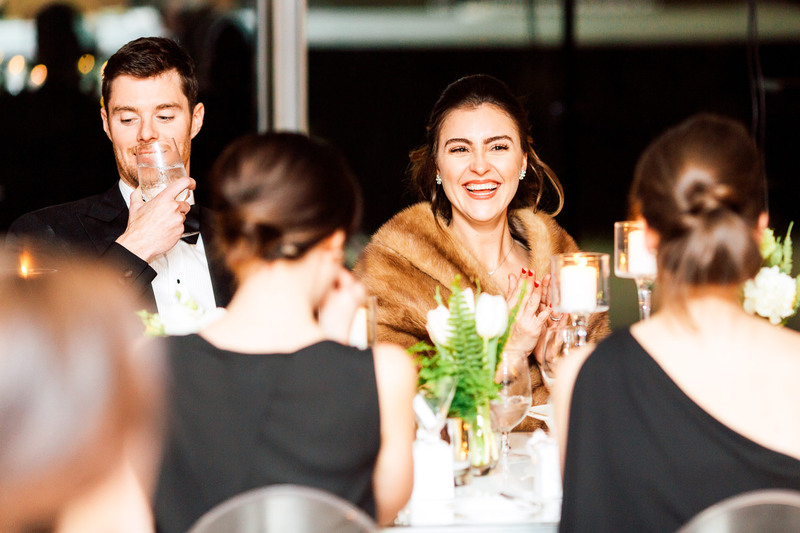 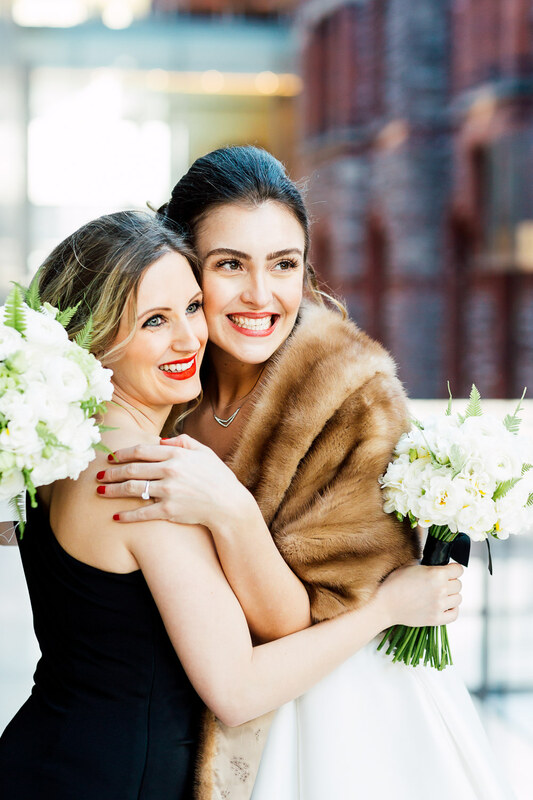 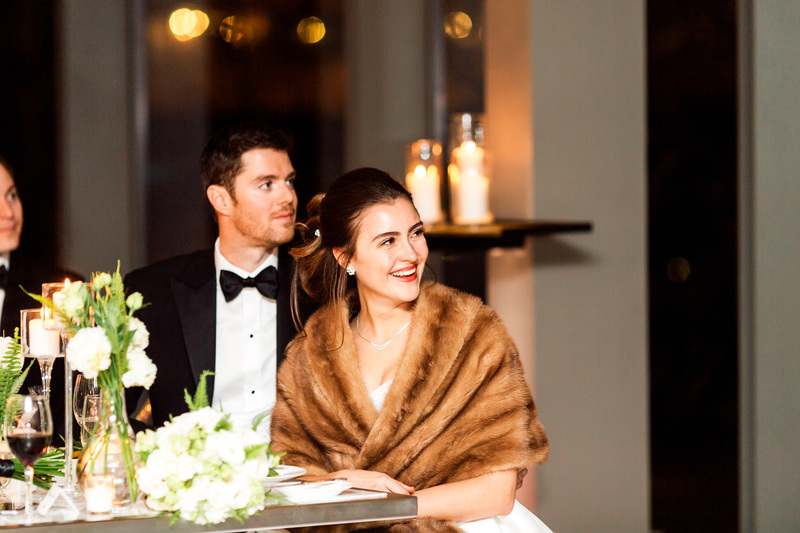 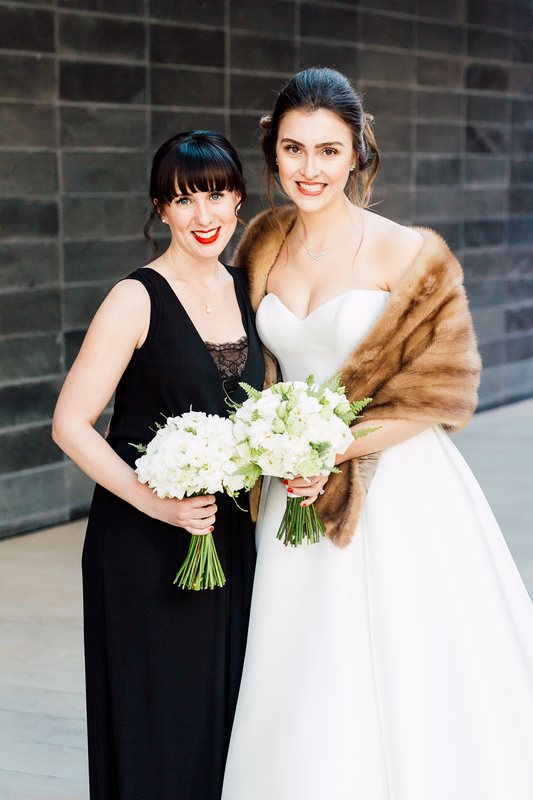 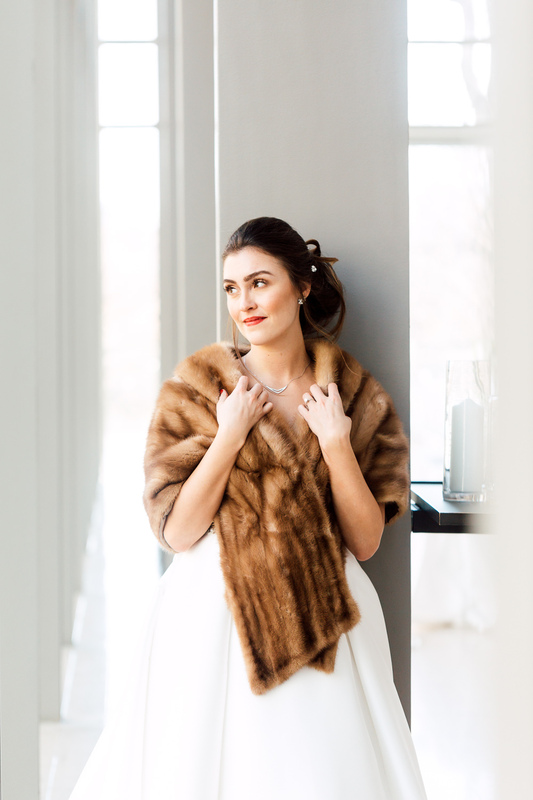 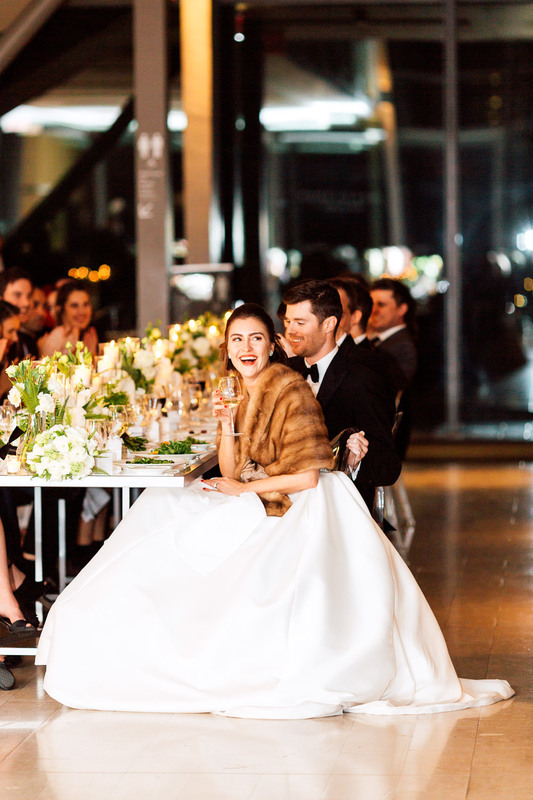 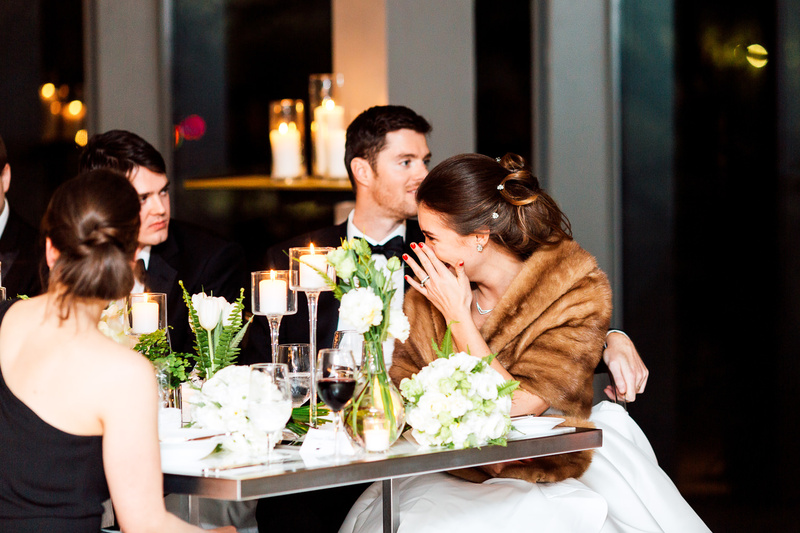 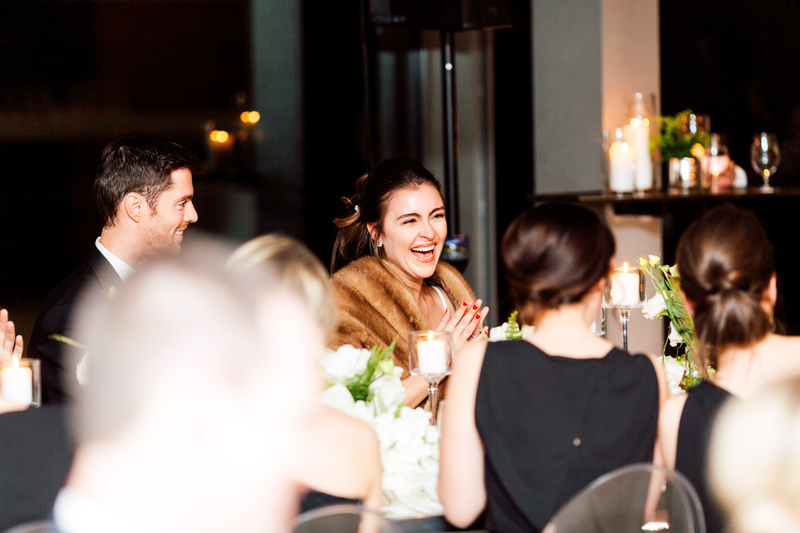 If it wasn’t for Erin’s sleeveless fur wrap around her shoulders, you wouldn’t be able to tell that her wedding took place in the beginning of March. 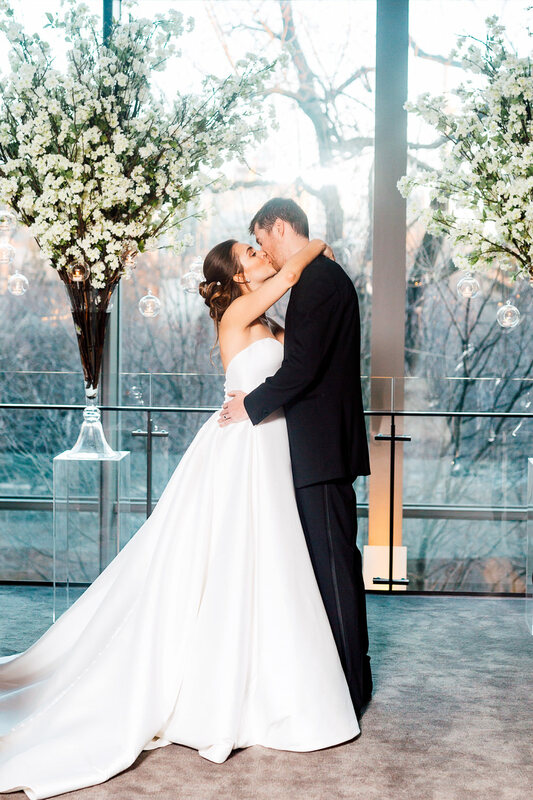 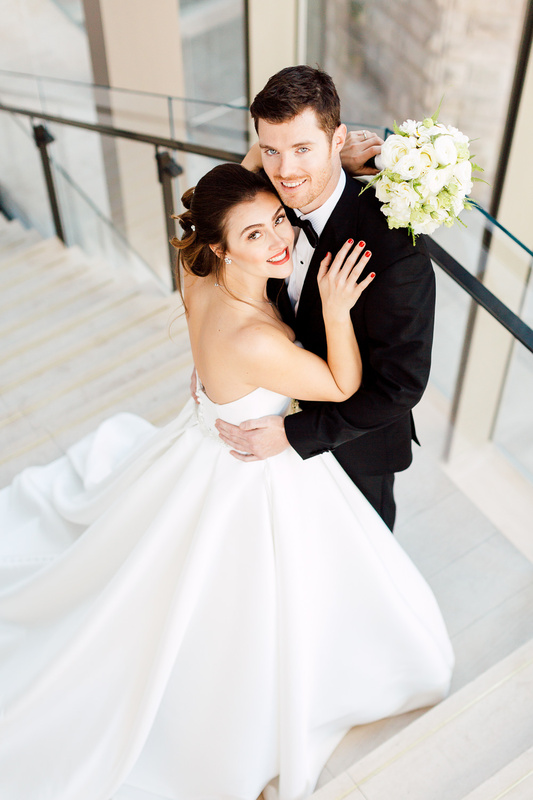 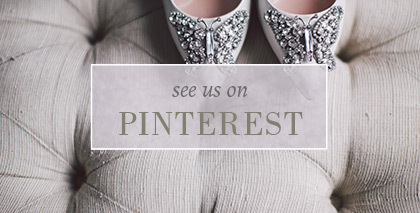 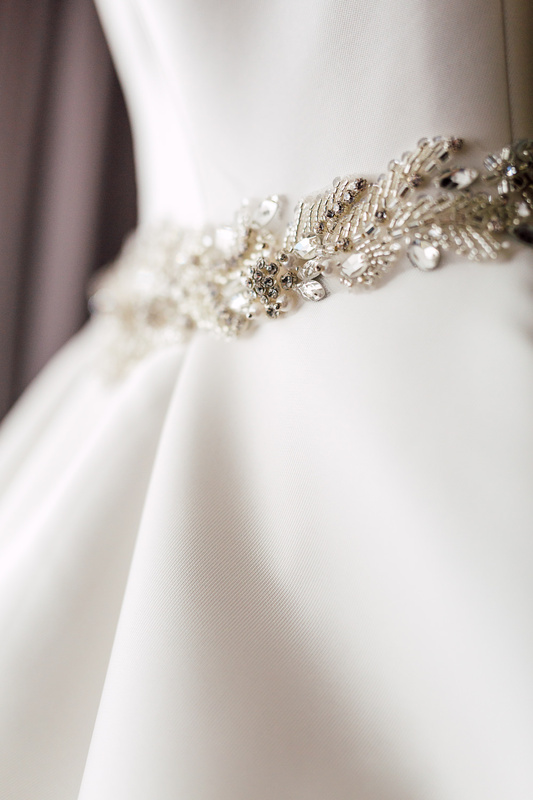 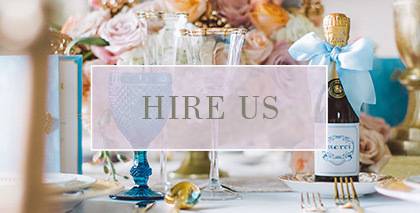 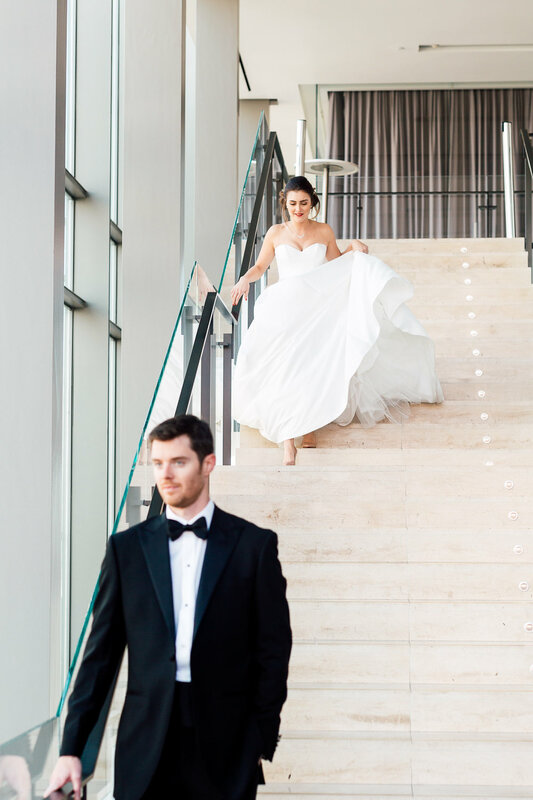 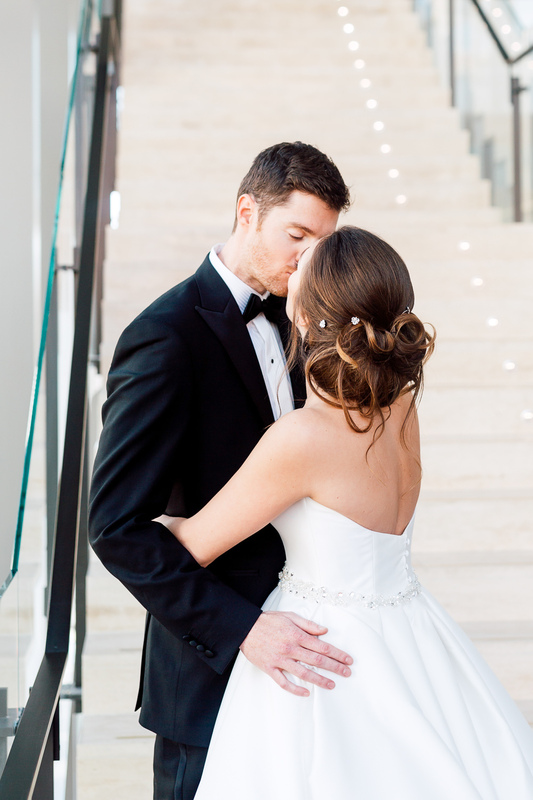 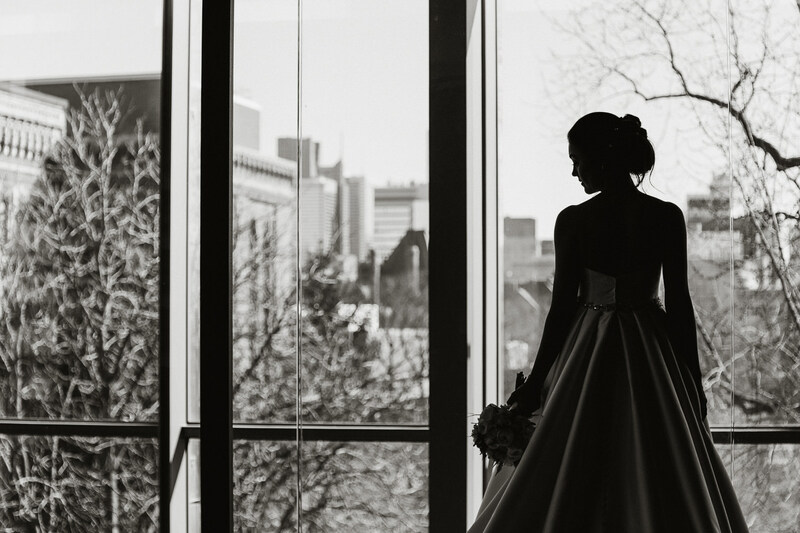 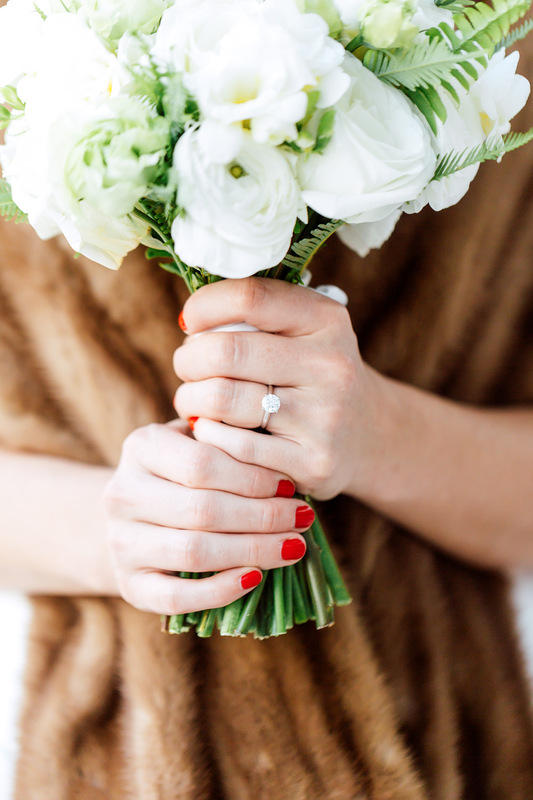 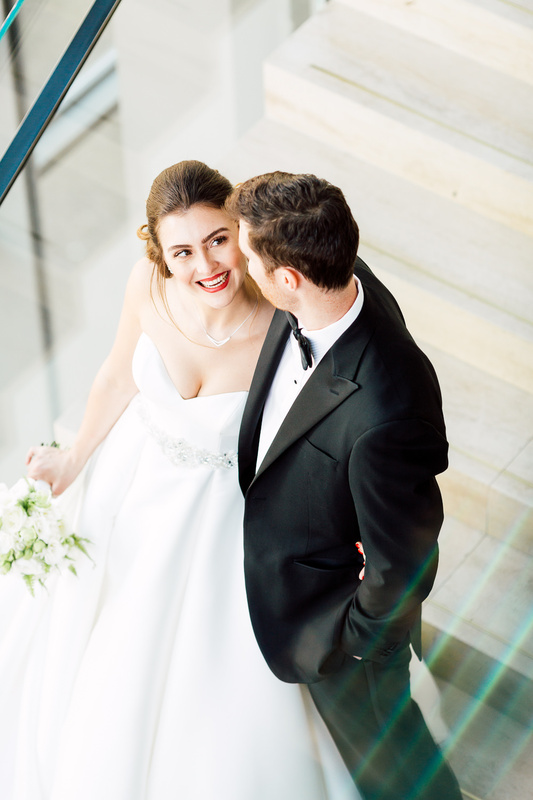 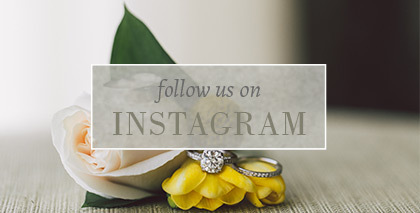 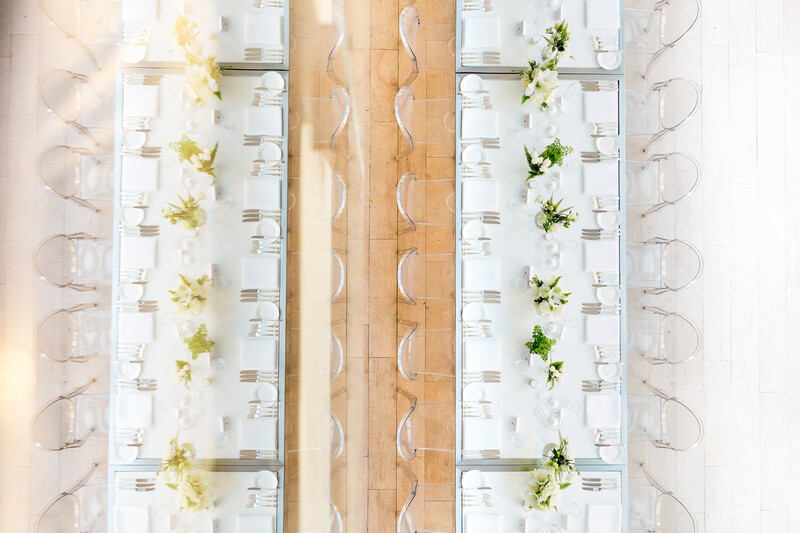 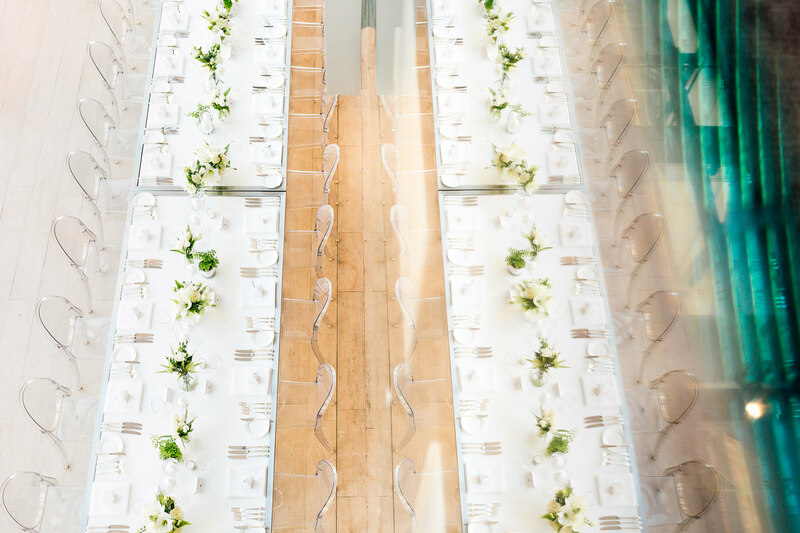 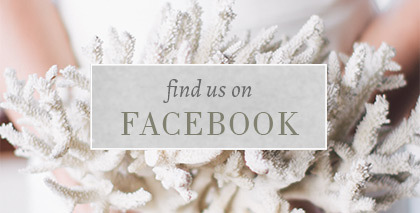 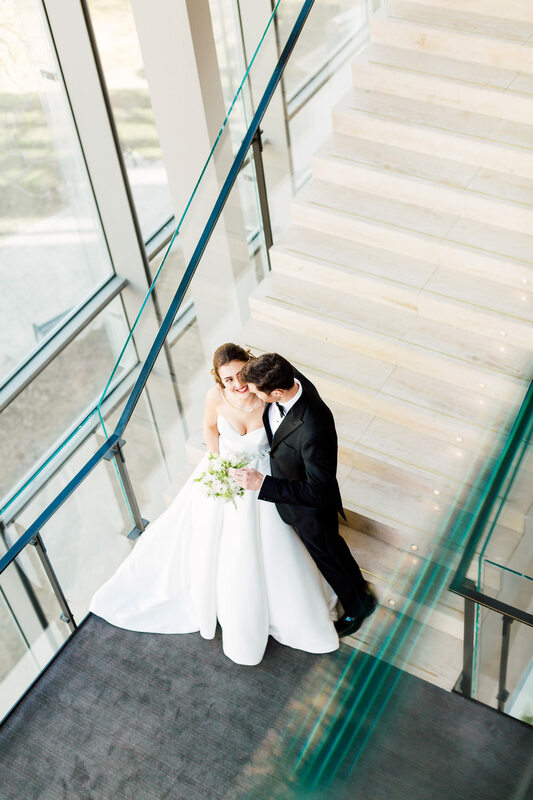 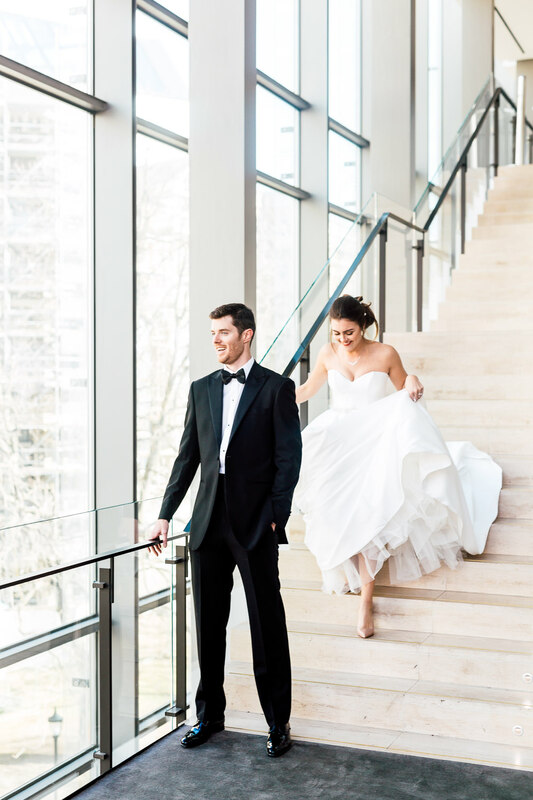 With the perfect venue, you can make your dream wedding happen during any of the four seasons! 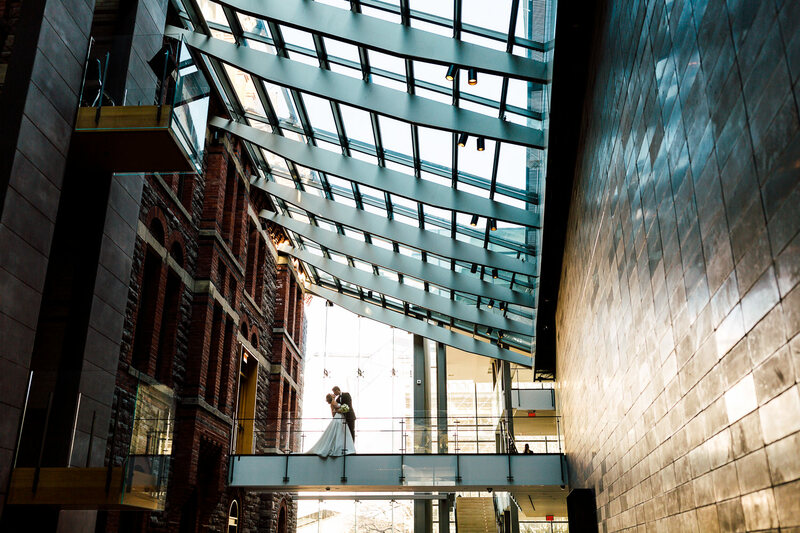 Thanks to the Royal Conservatory of Music, there’s space to have an indoor celebration without feeling like you’re within four walls. 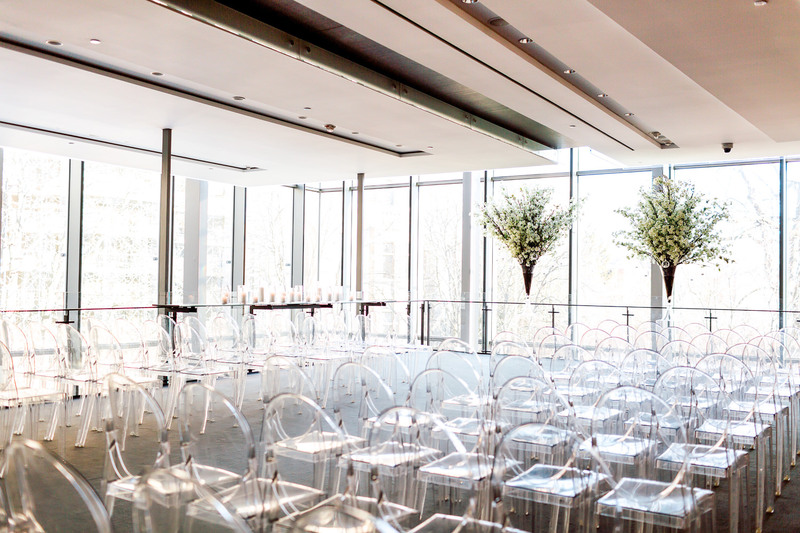 The floor to ceiling windows keeps the place bright and airy, filling the rooms with as much natural light as possible. 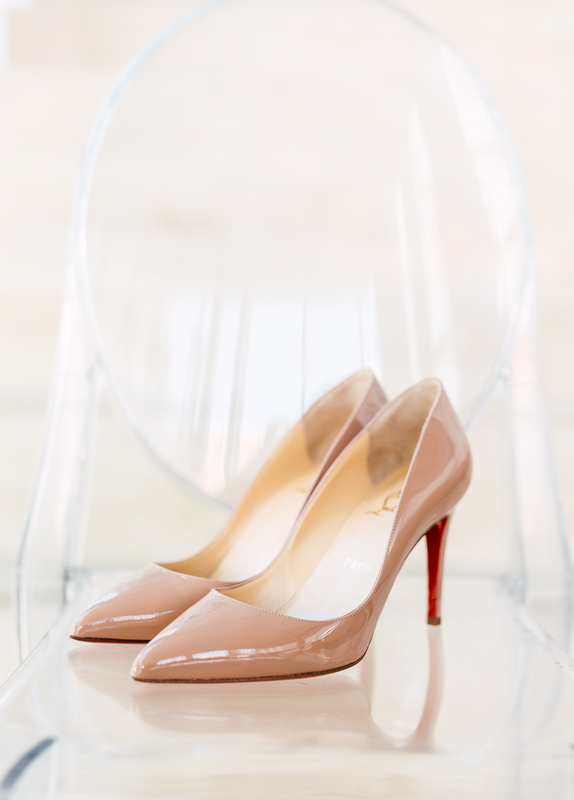 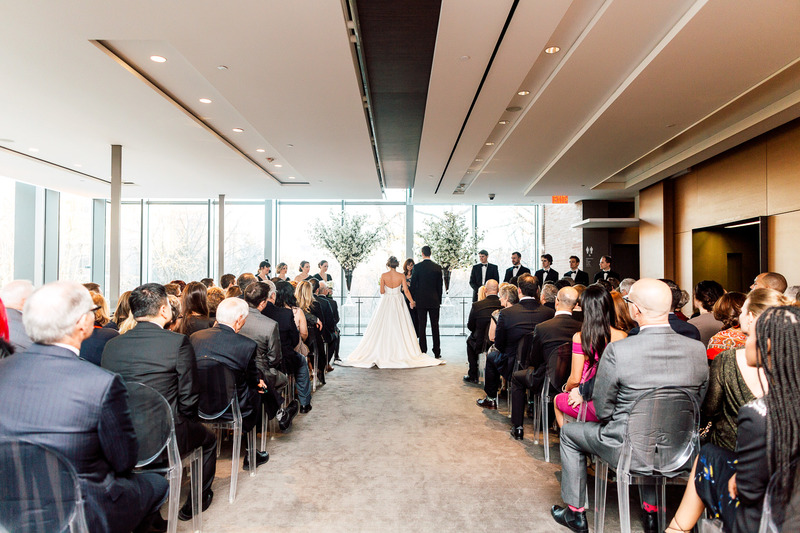 Of course, it helps that these large windows actually face breathtaking views! 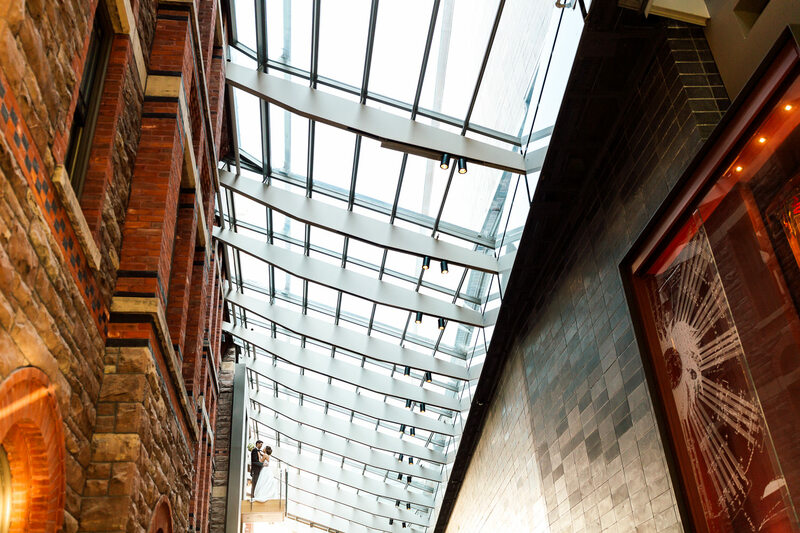 From the Philosopher’s Walk to the Royal Ontario Museum, you and your guests get to enjoy this downtown Toronto neighbourhood. 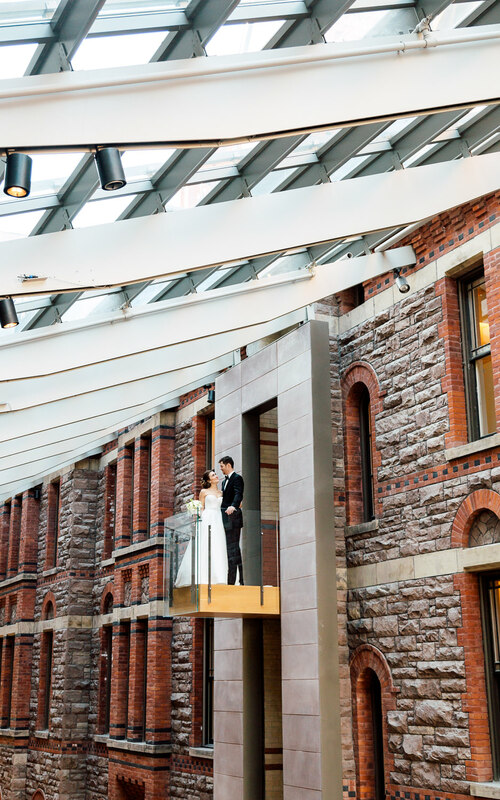 We absolutely love how the building’s architecture tastefully combines modern design with the existing historical heritage charm. 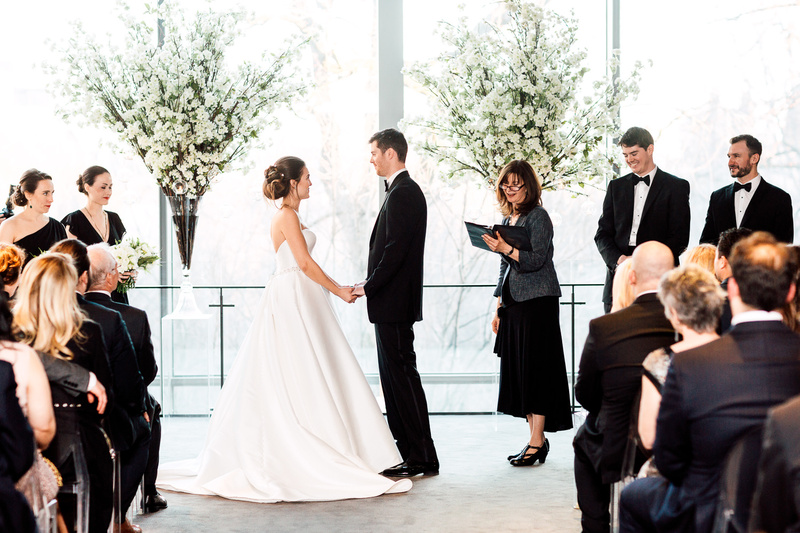 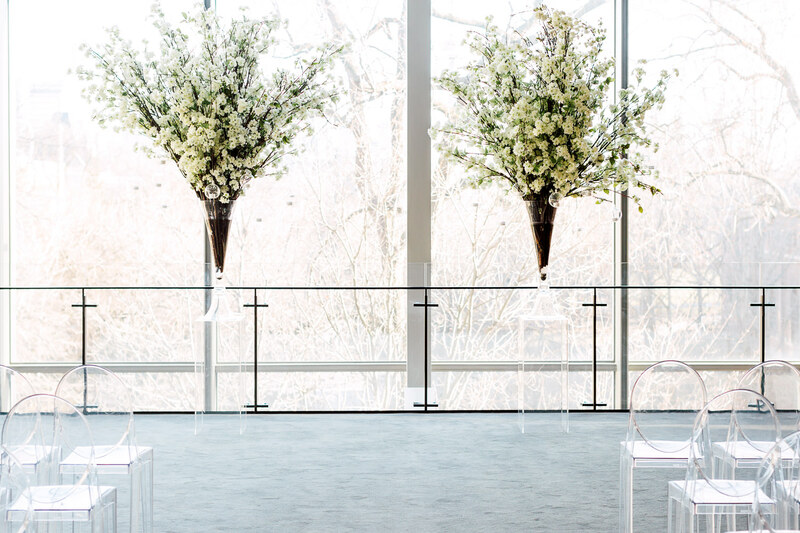 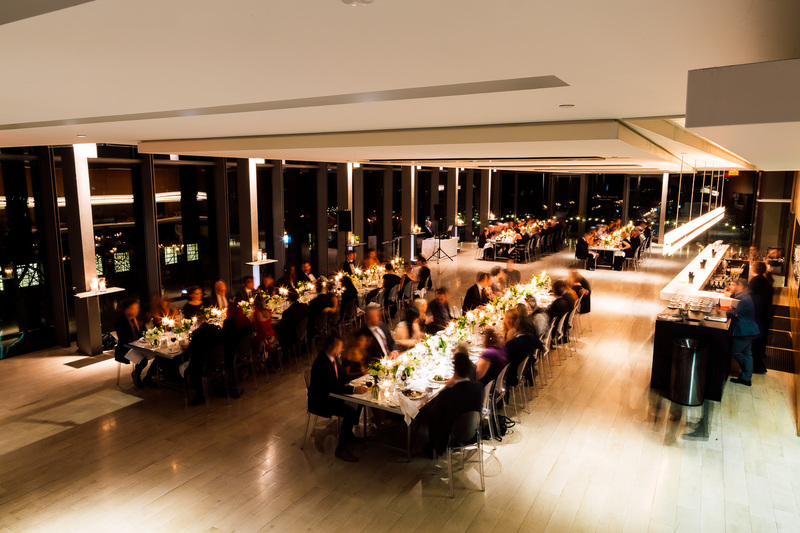 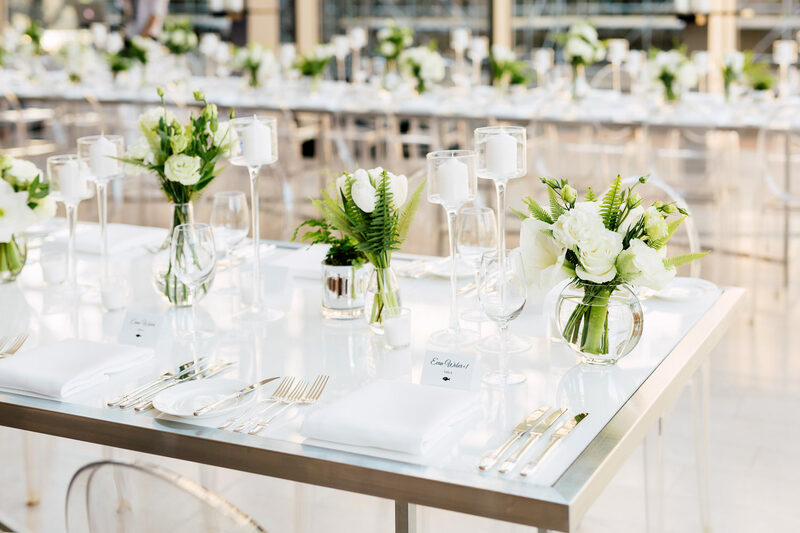 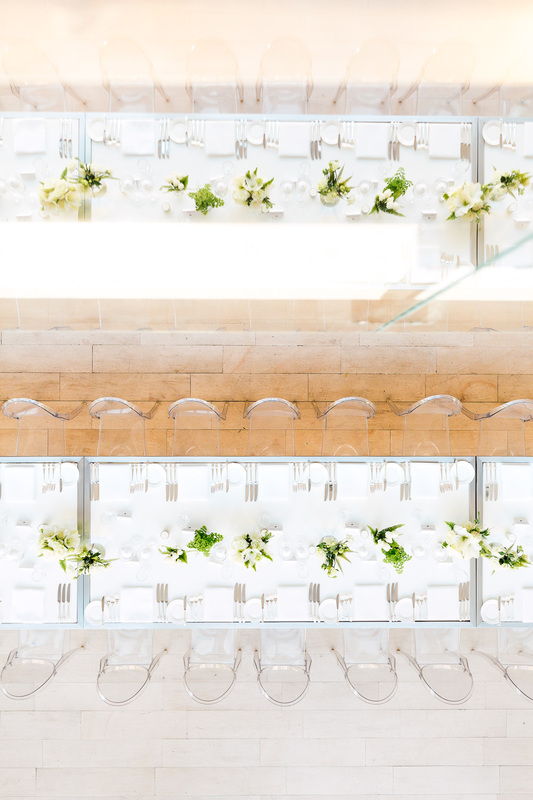 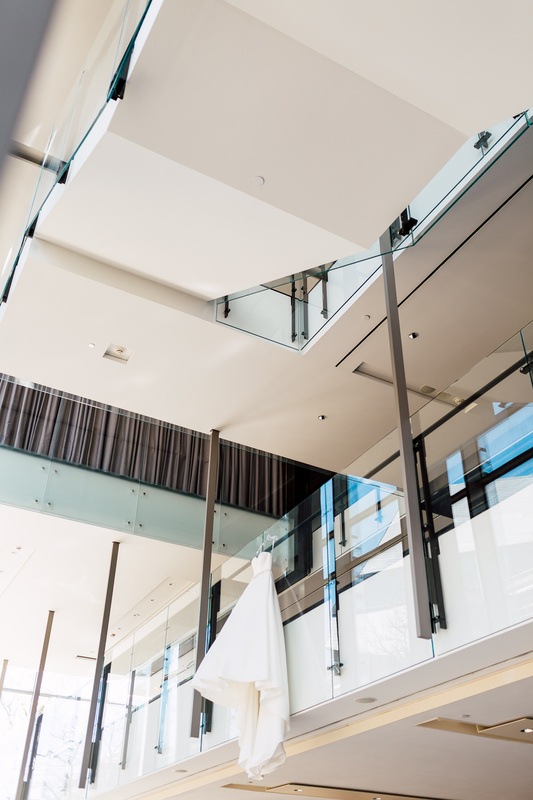 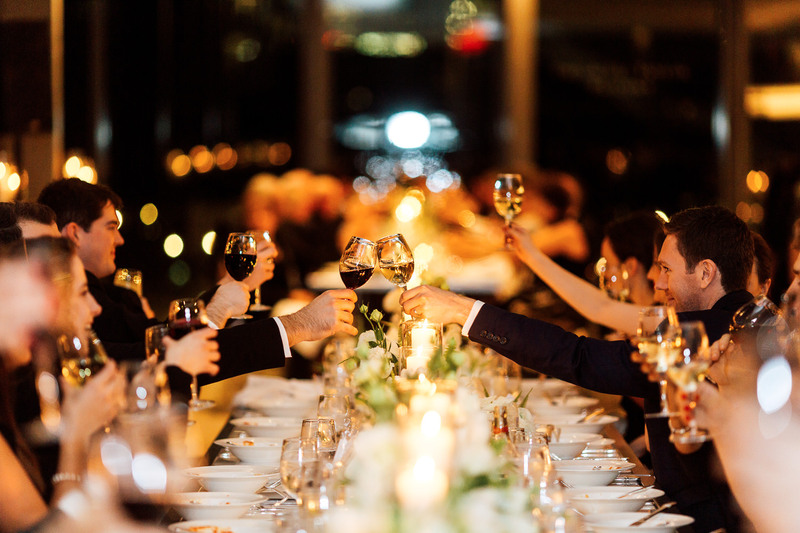 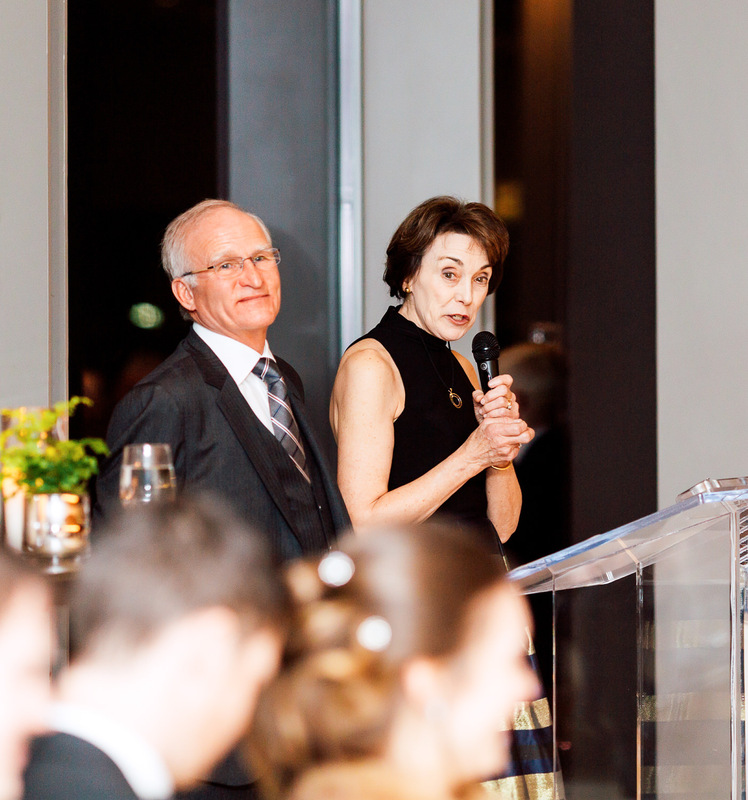 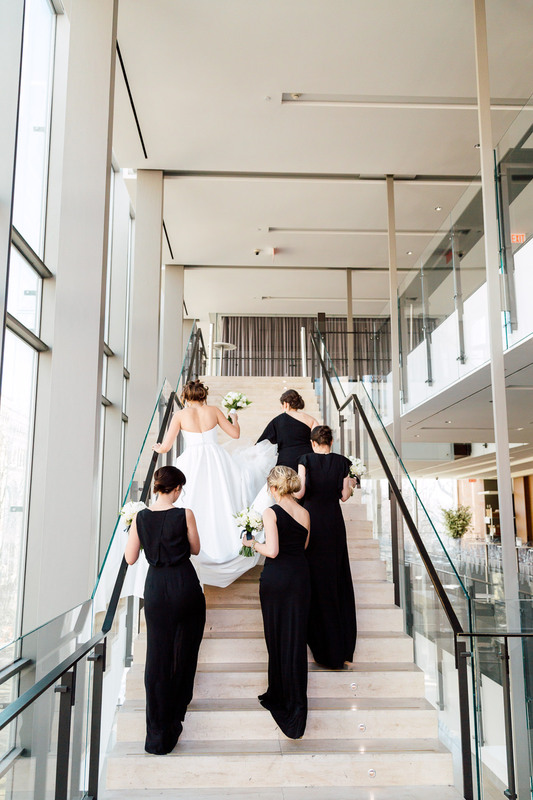 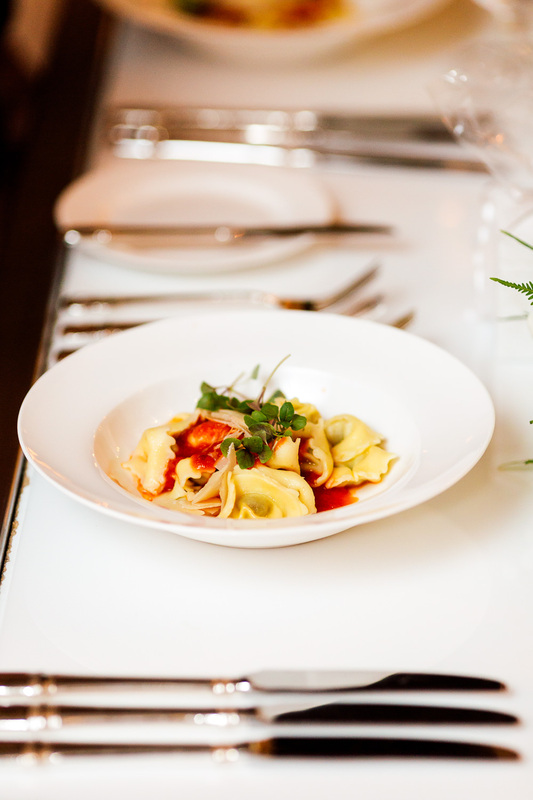 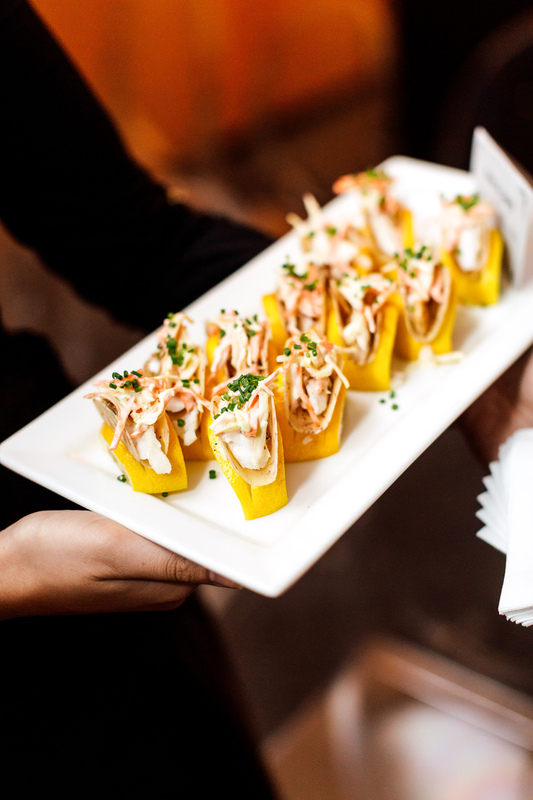 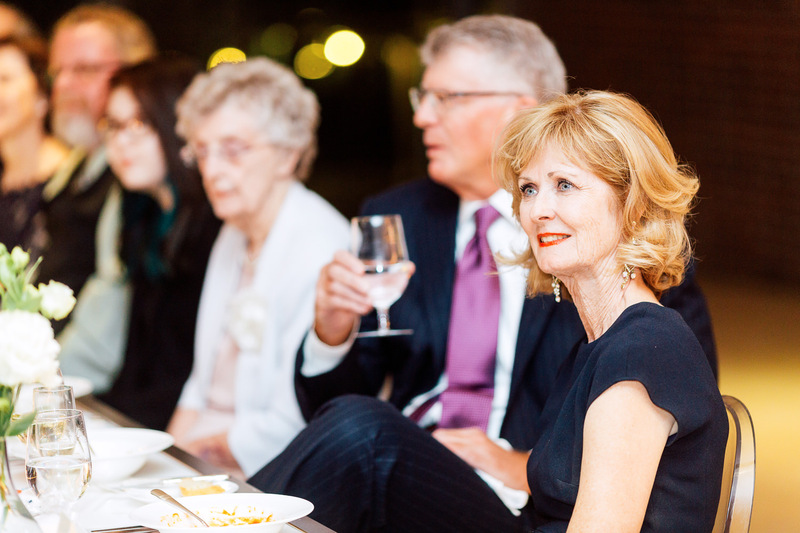 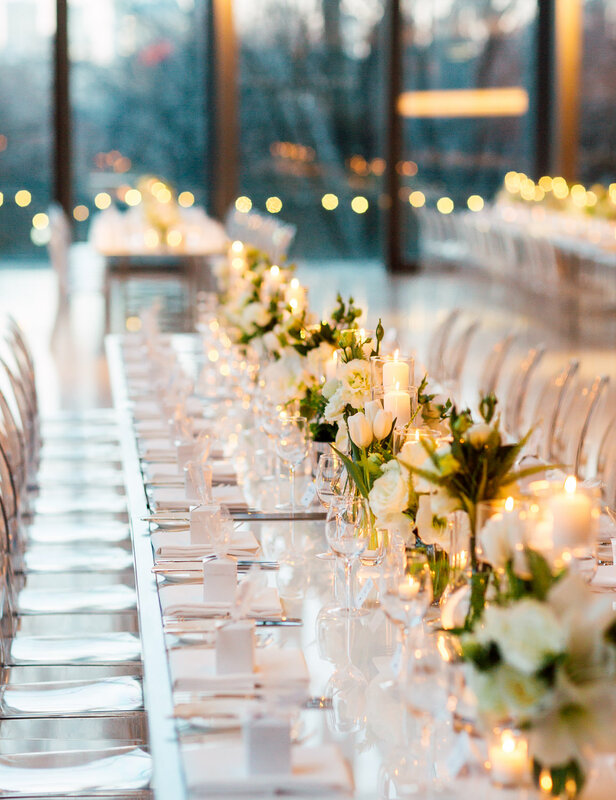 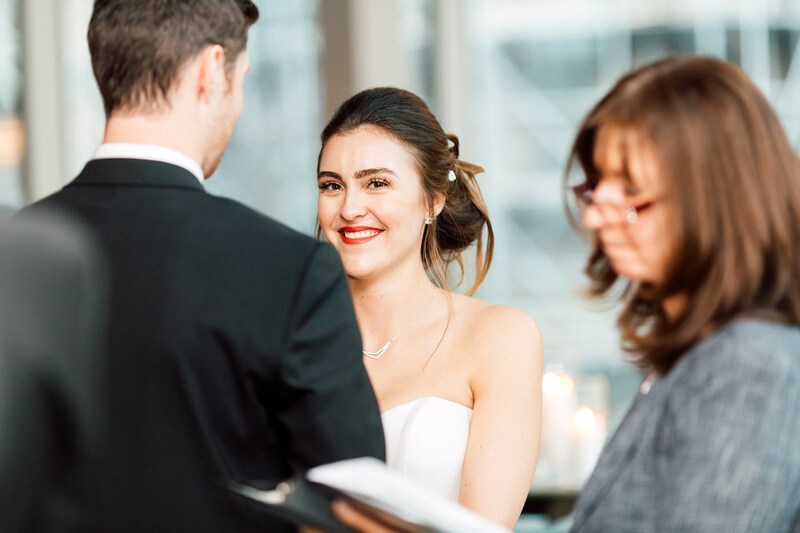 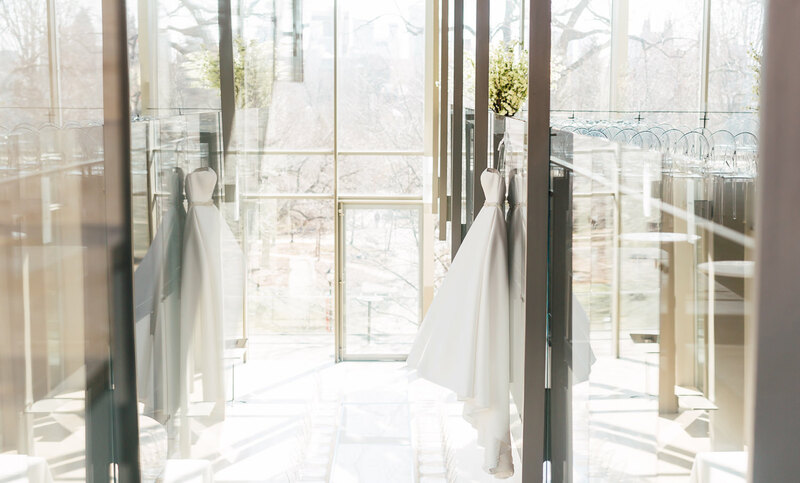 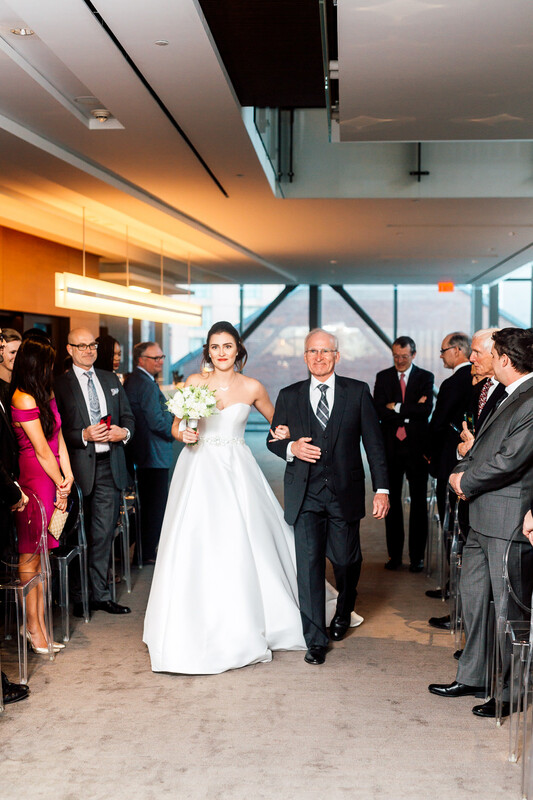 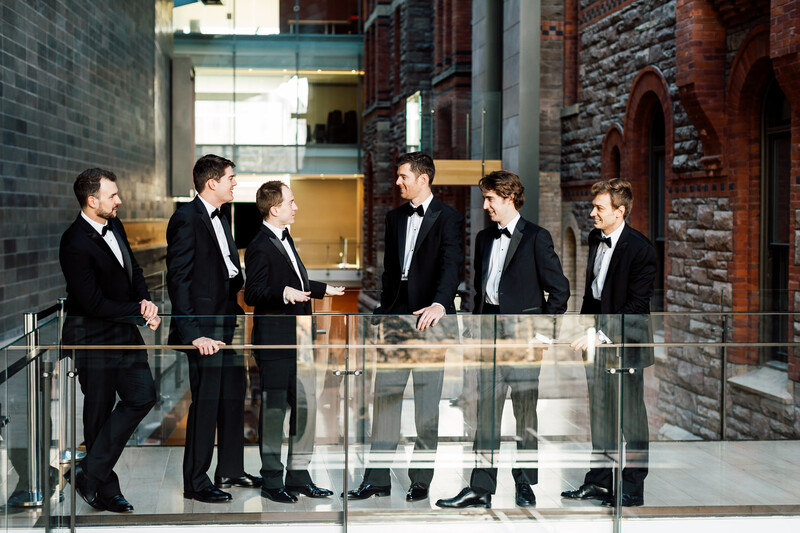 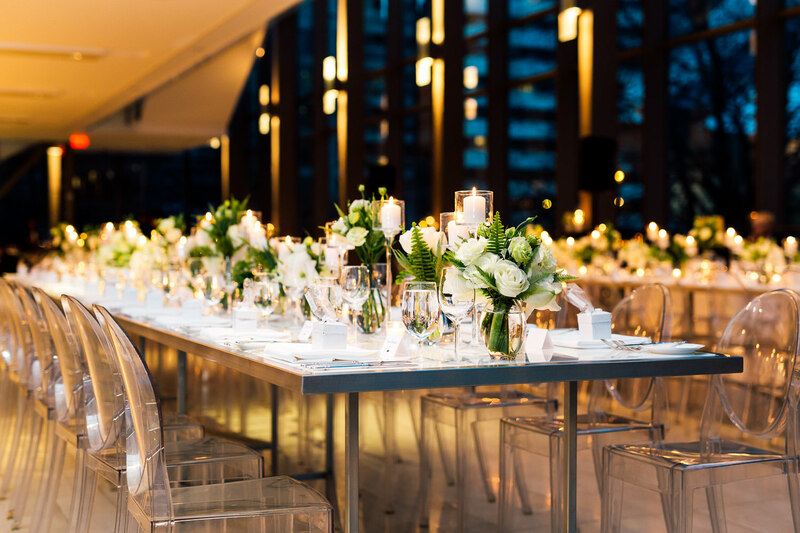 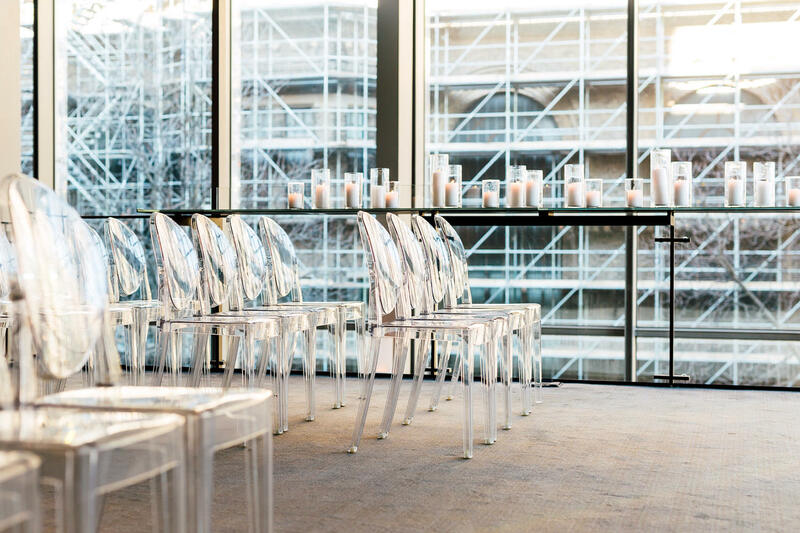 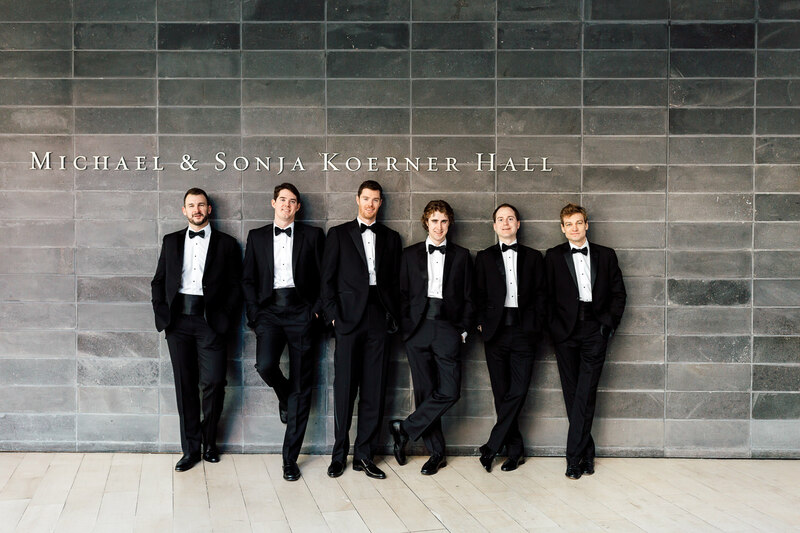 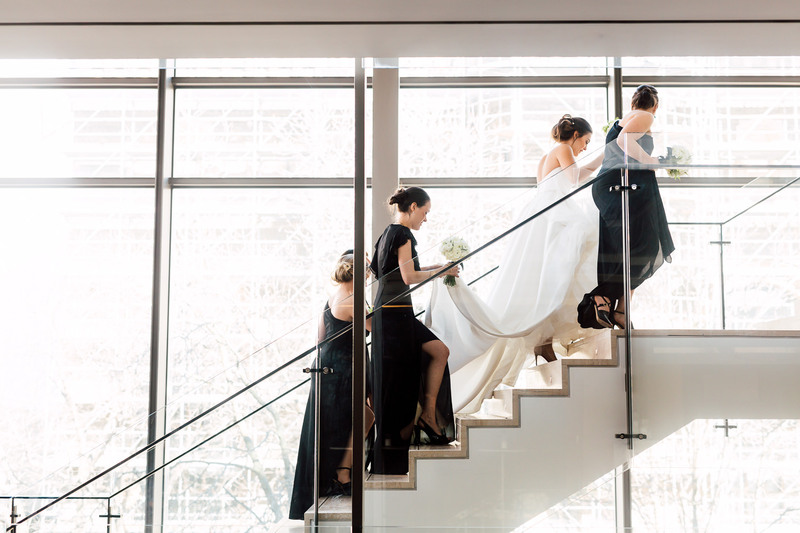 Whether you’re aiming for a sophisticated modern affair or a traditional celebration, the Royal Conservatory of Music is a versatile environment ready to be transformed without limitations. 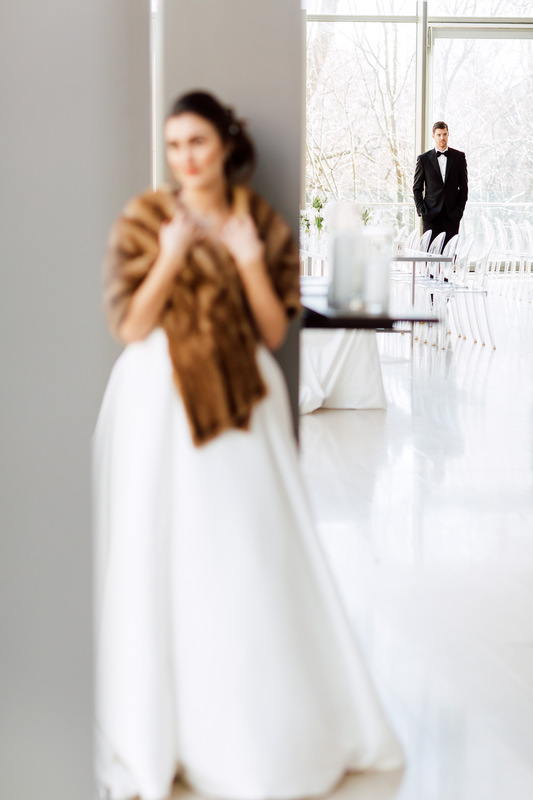 There was no need to step out to the cold for the portraits since there is so much to photograph in the venue itself. 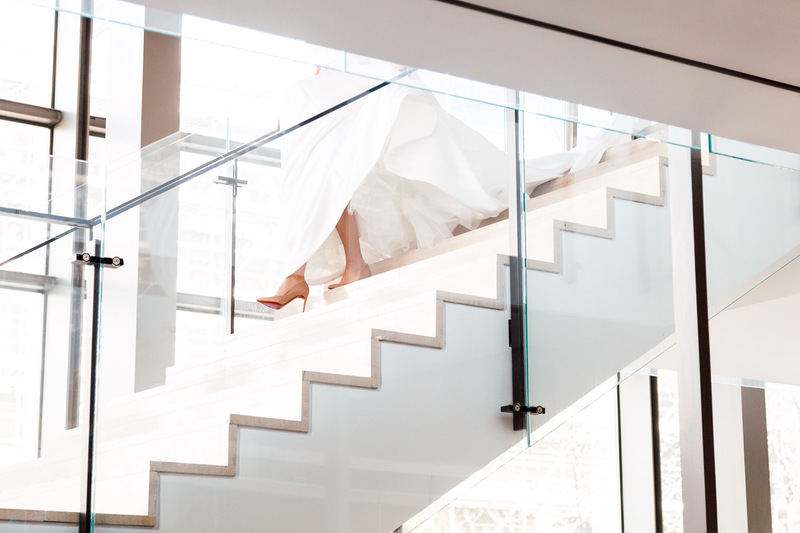 Just check out the glass staircase! 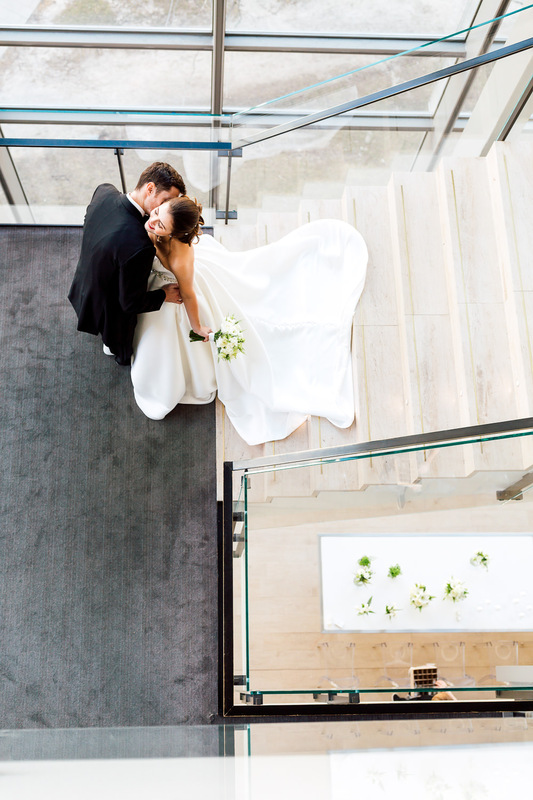 The transparency of the railings gave the stairs a floating effect – it was the perfect location for a dramatic first look. 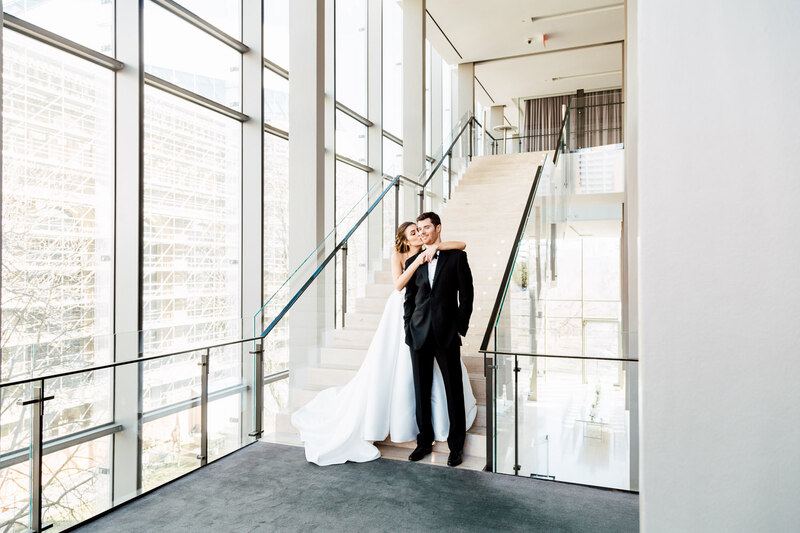 There was also so much room to play with heights, angles and reflections that we might have had too much fun getting creative with Erin and Fraser’s portraits. 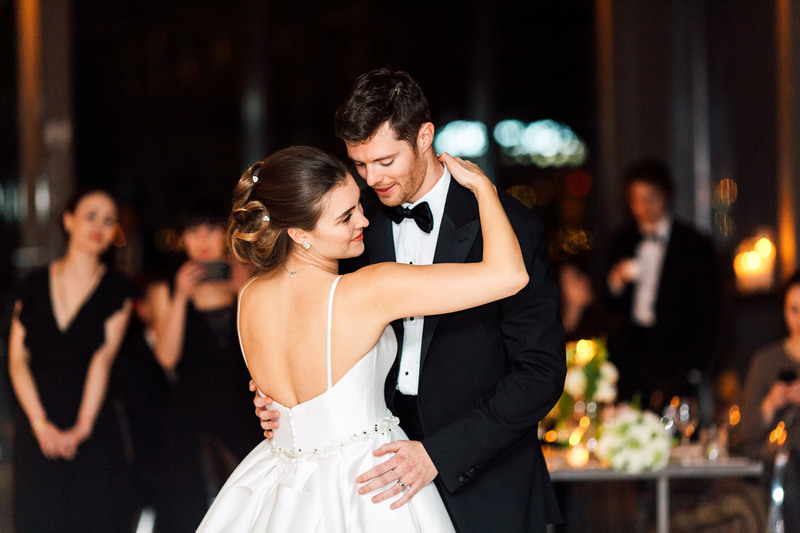 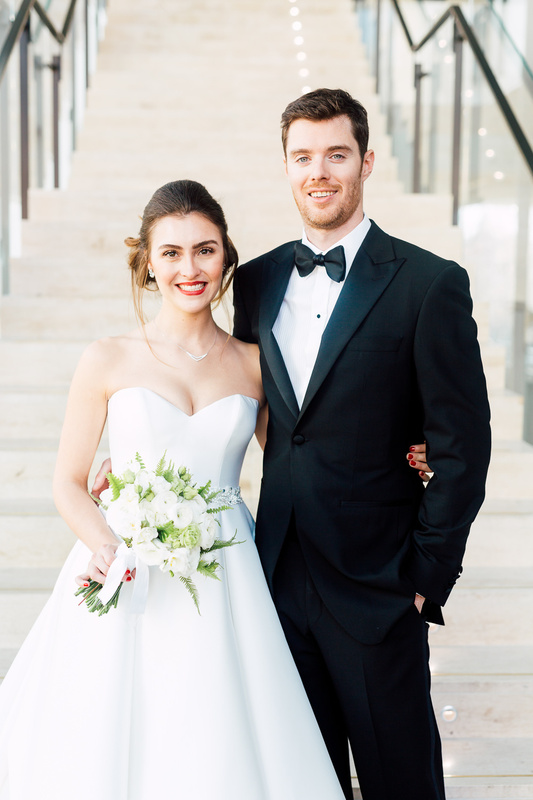 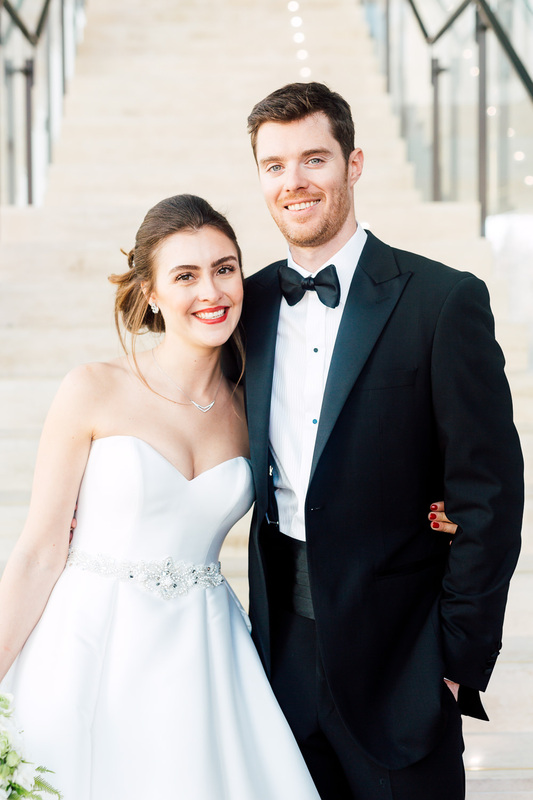 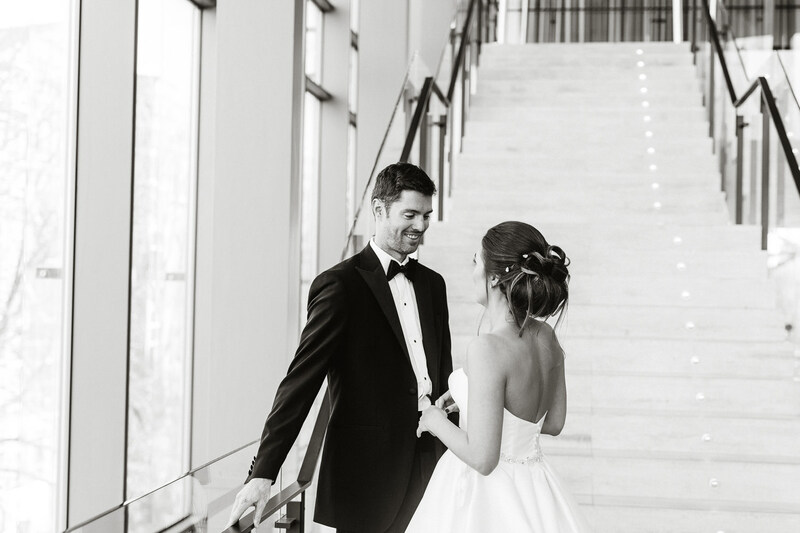 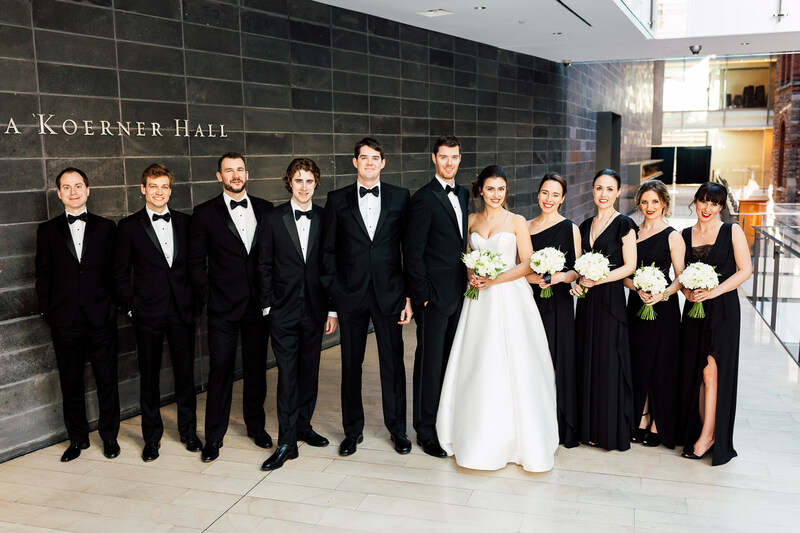 For Erin and Fraser’s big day, they kept it simple and timeless with their style. 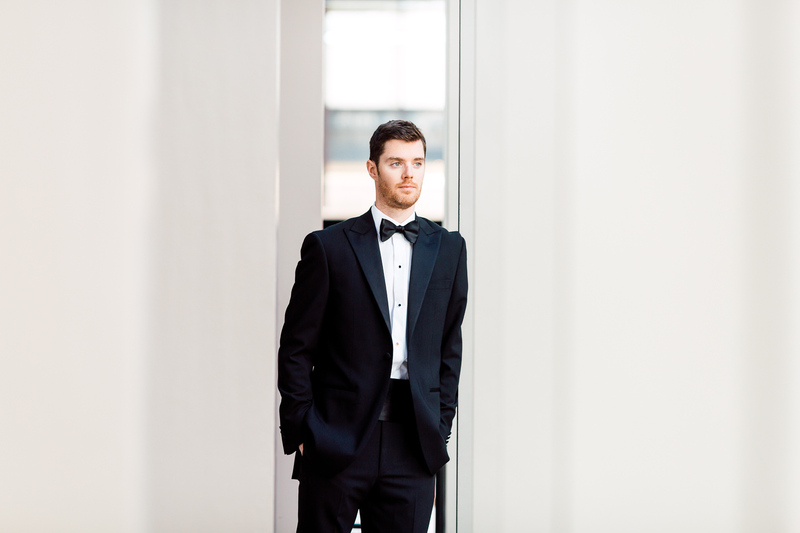 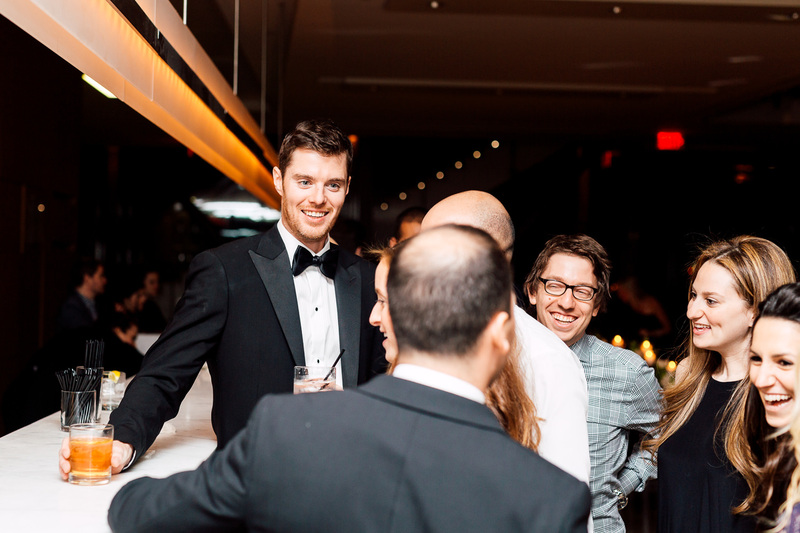 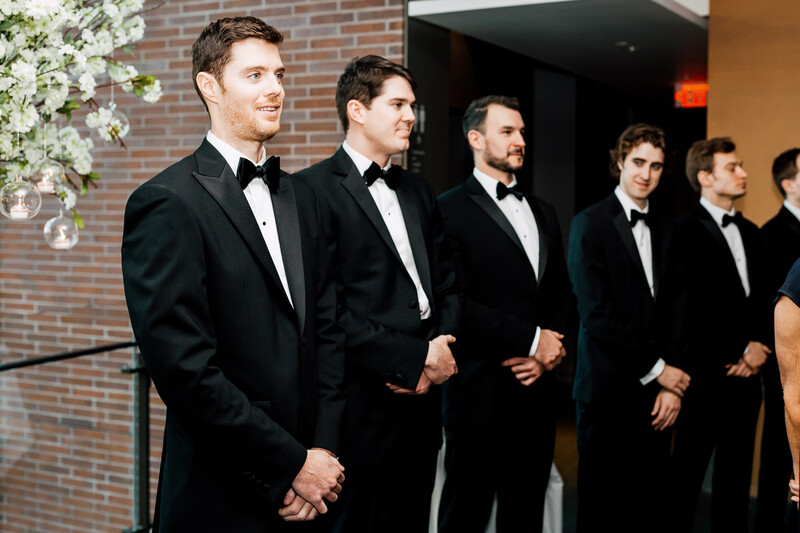 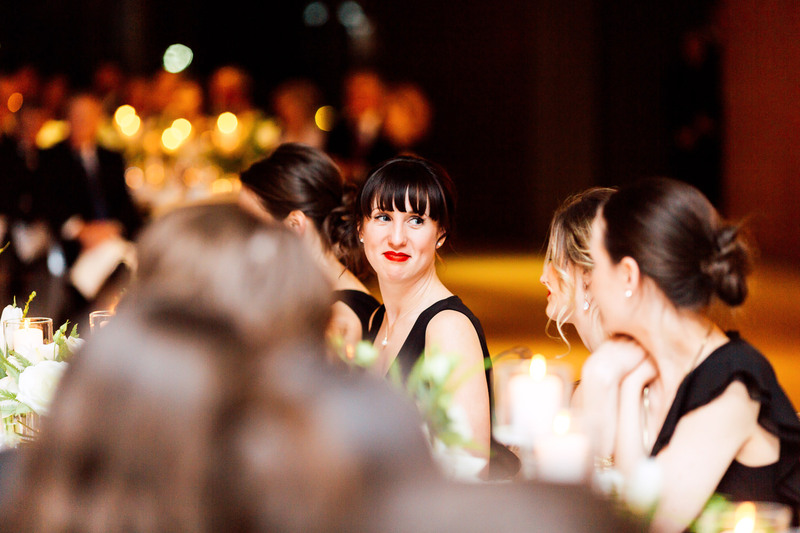 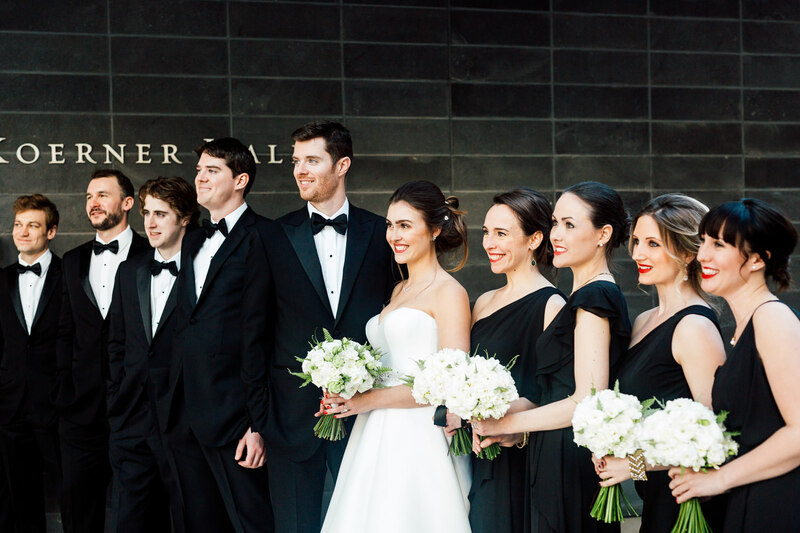 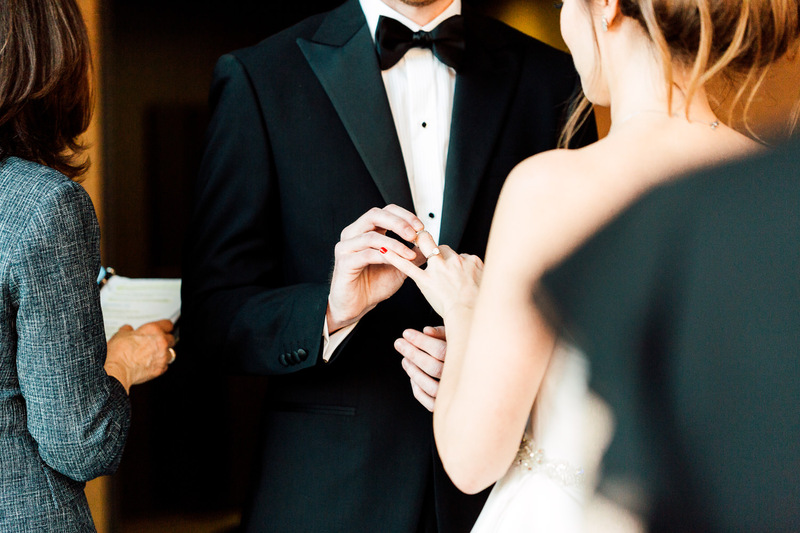 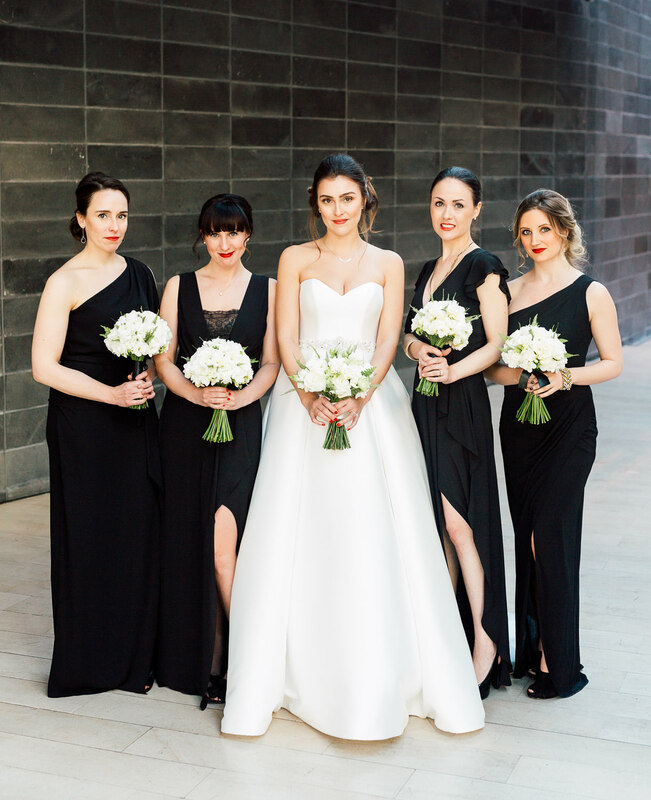 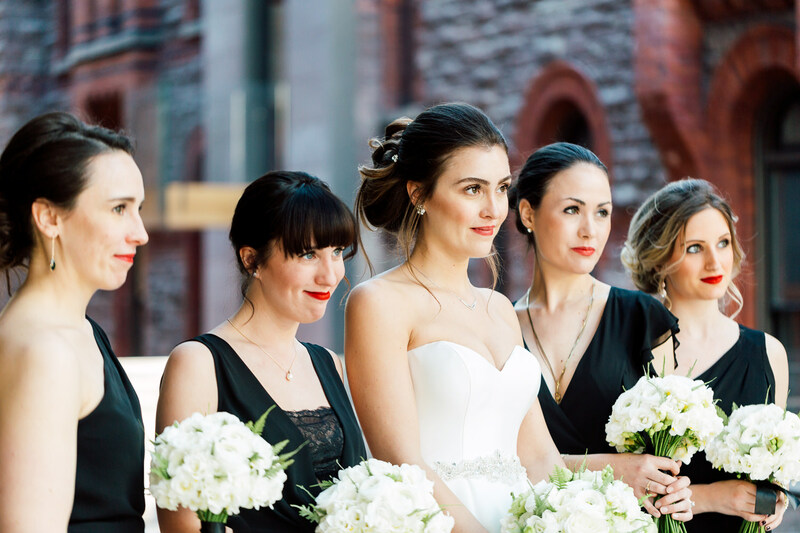 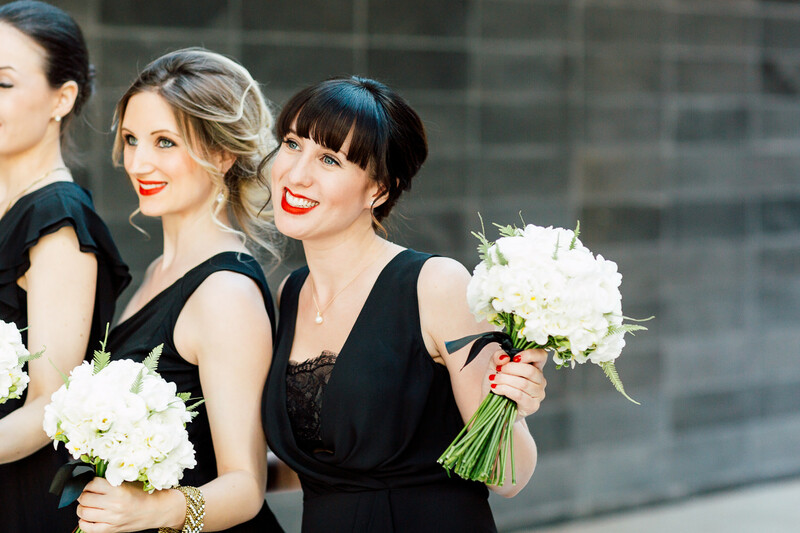 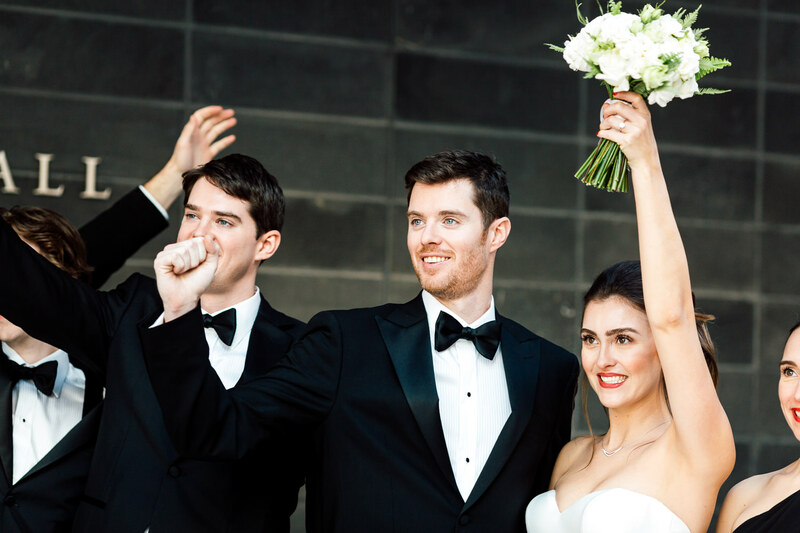 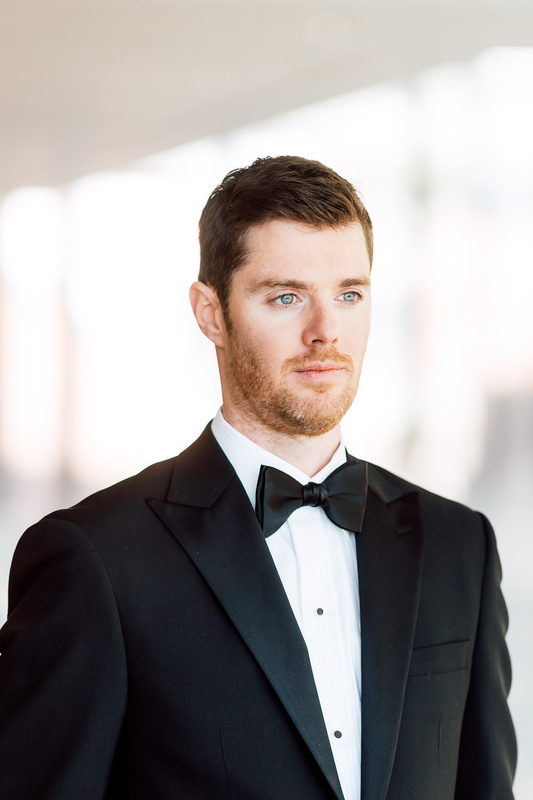 The bridal party had the guys wearing black tux while the girls wore different black dresses. 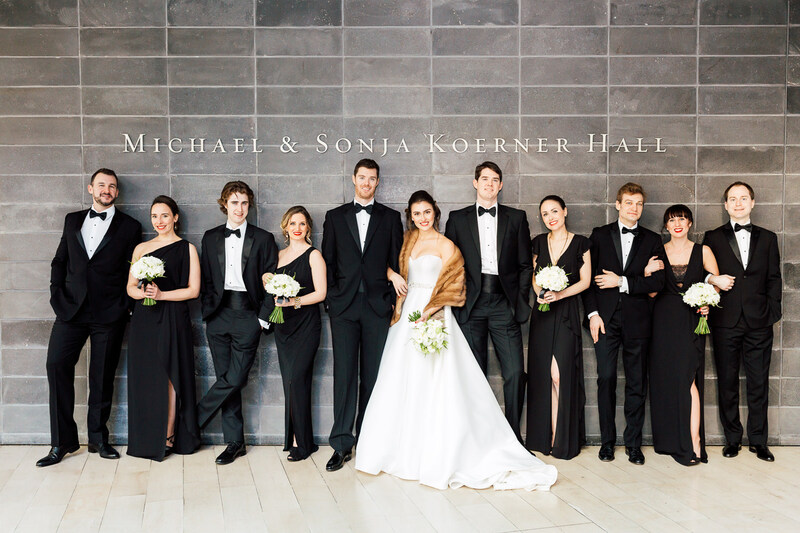 They all looked incredibly classy and vogue ready. 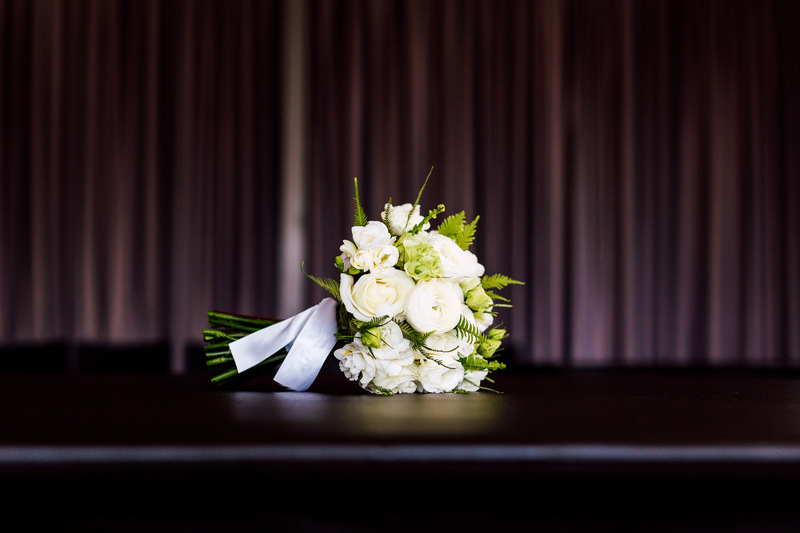 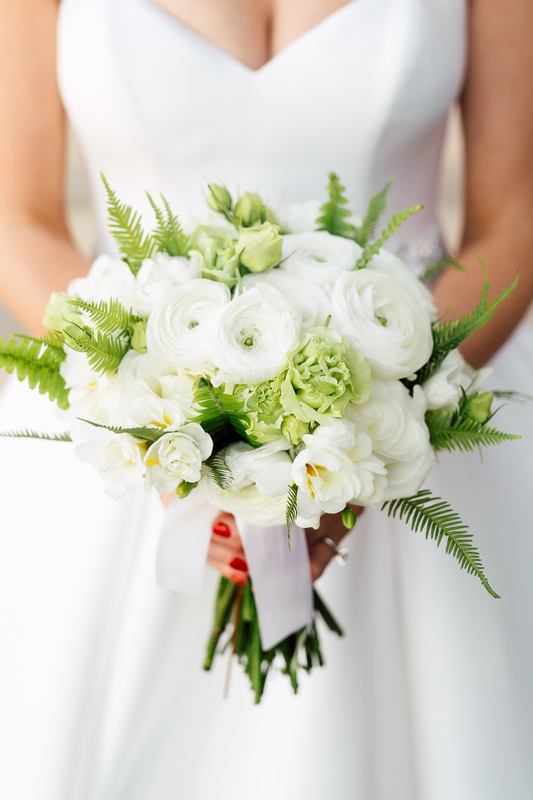 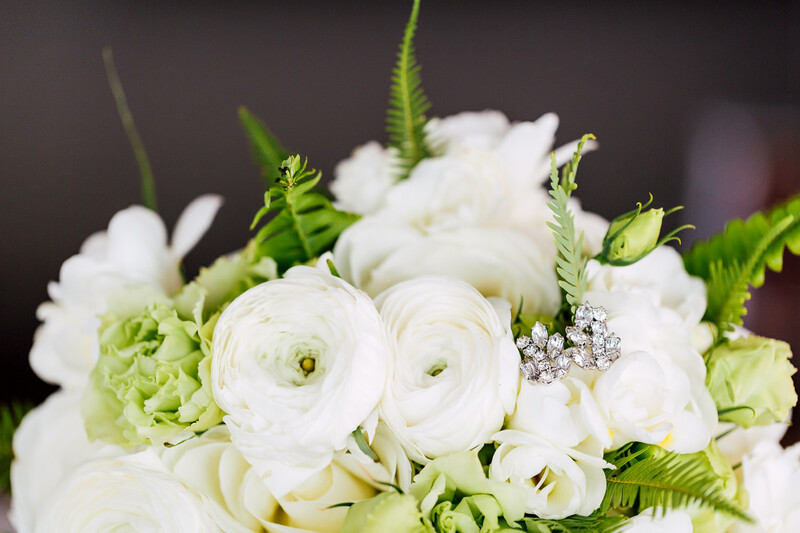 To balance the darker neutrals, the natural white and green colour palette found in the flower bouquets by Stemz brought the softness. 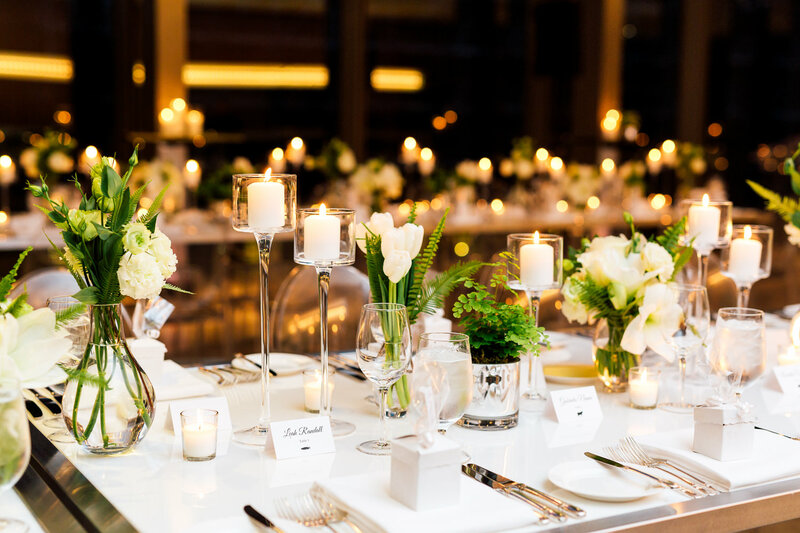 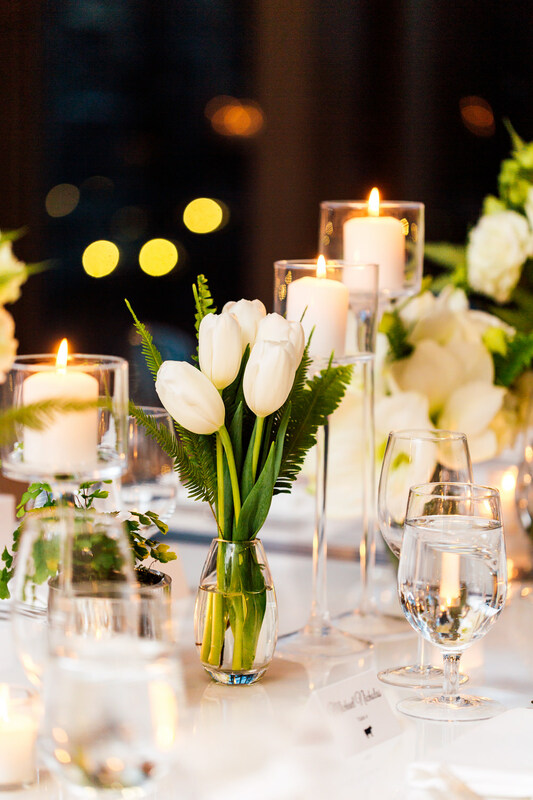 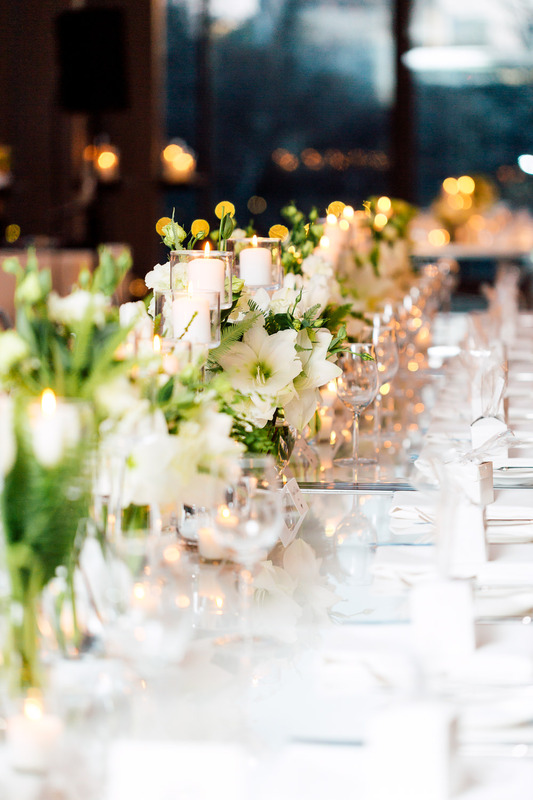 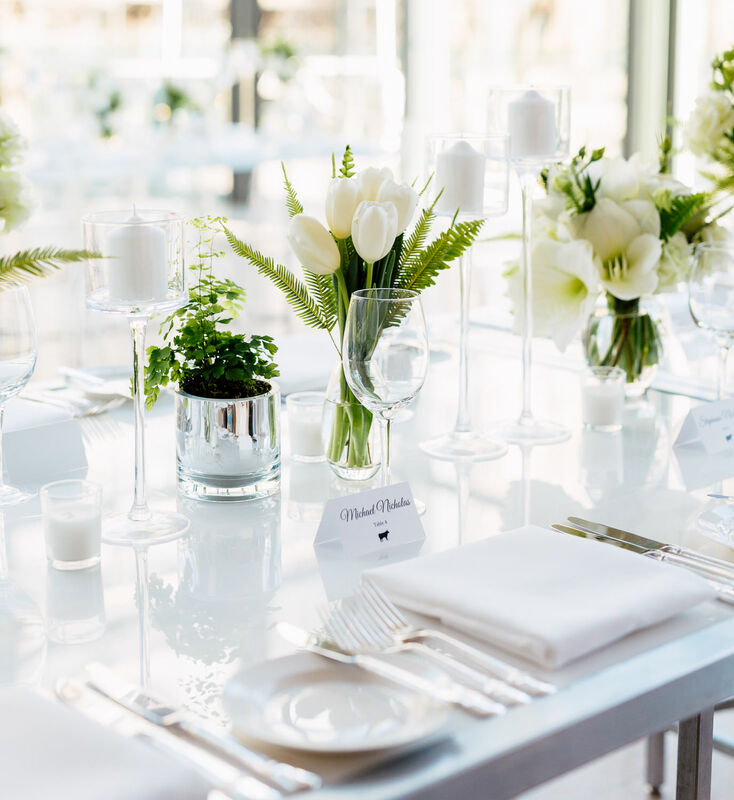 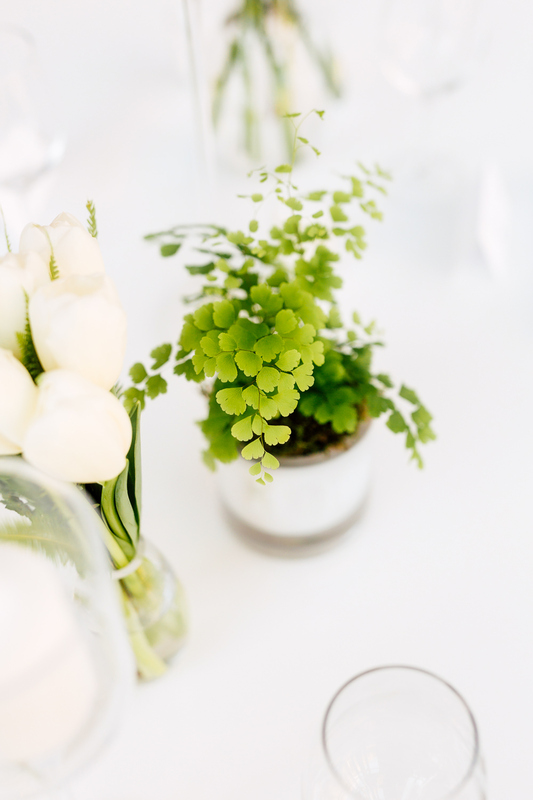 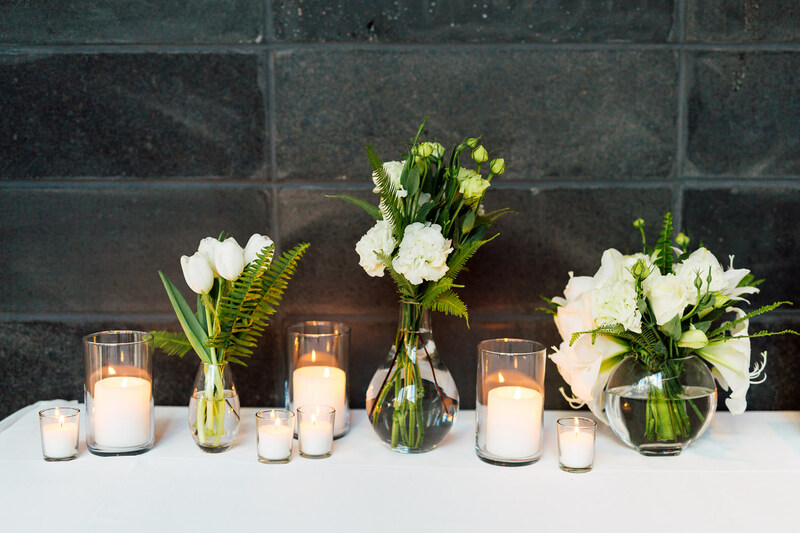 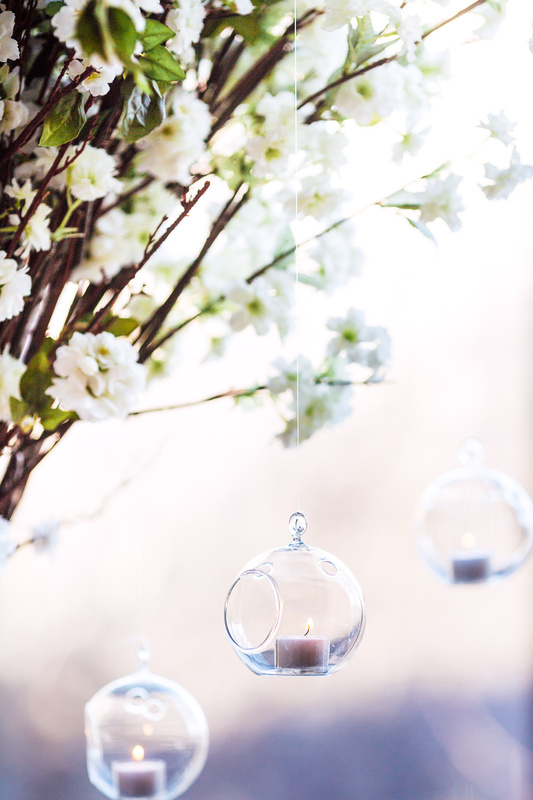 At the reception, the same palette can be found in small doses of elegant white flowers and green foliage along with some candles. 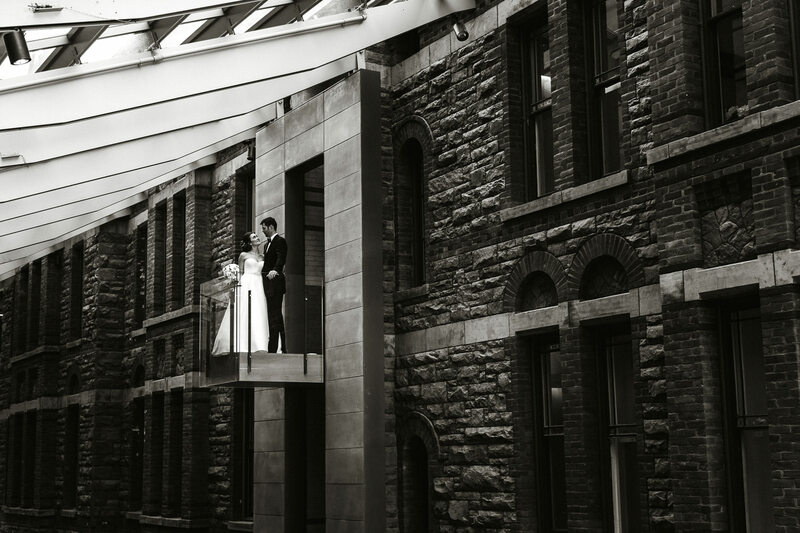 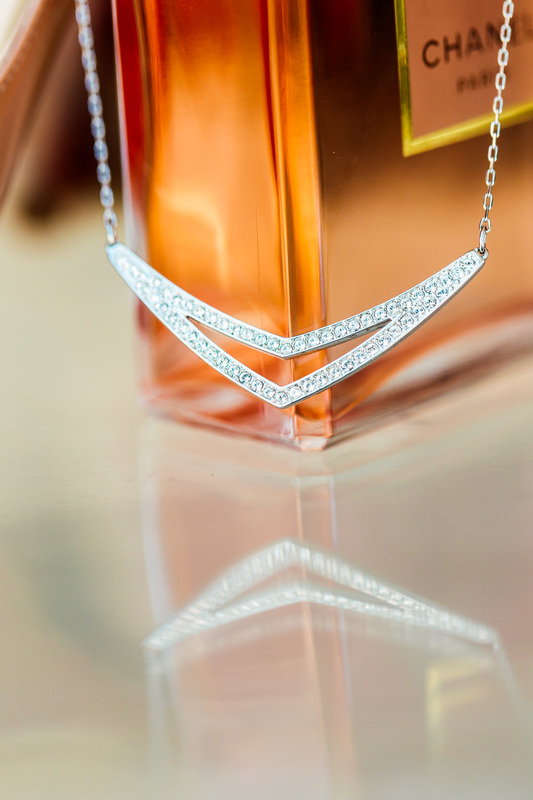 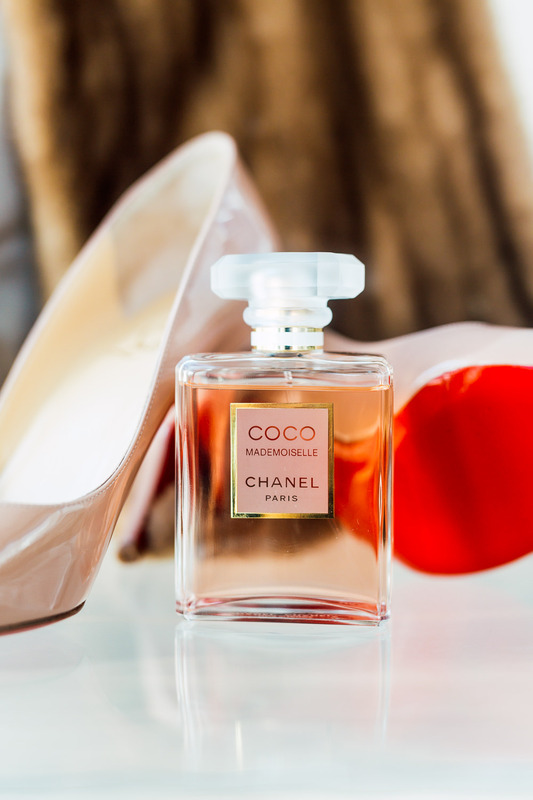 Overall the combination made the atmosphere all the more romantic. 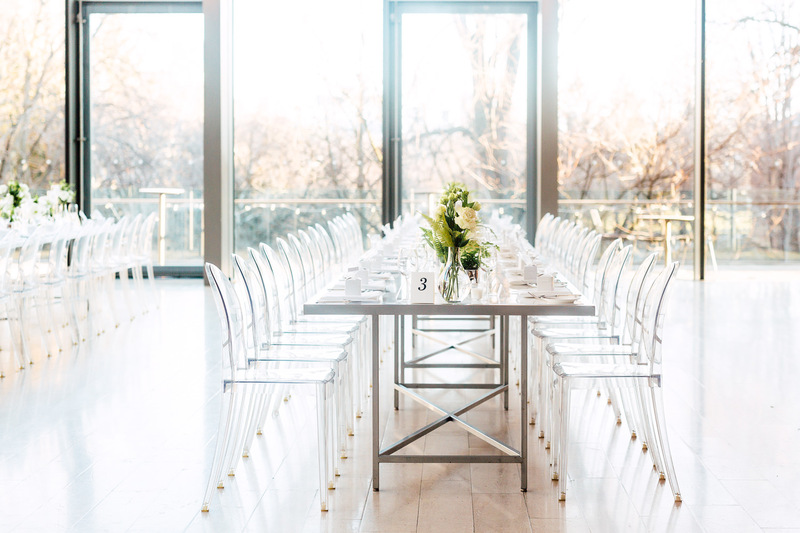 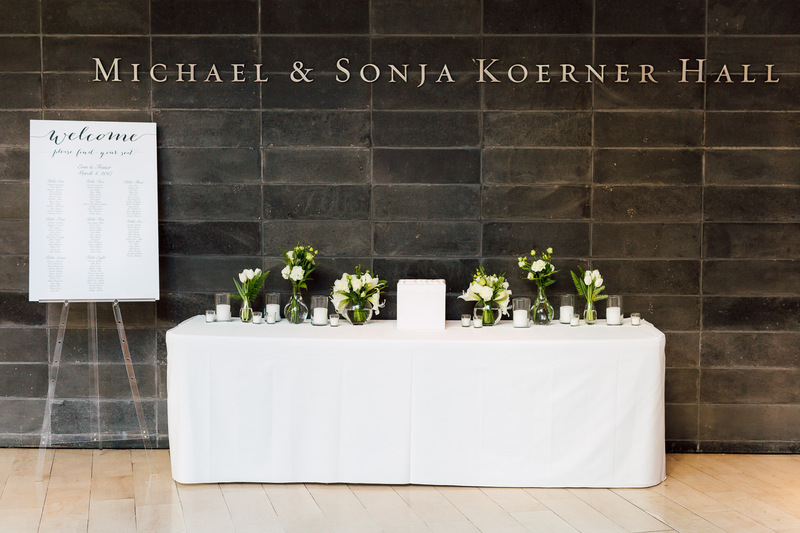 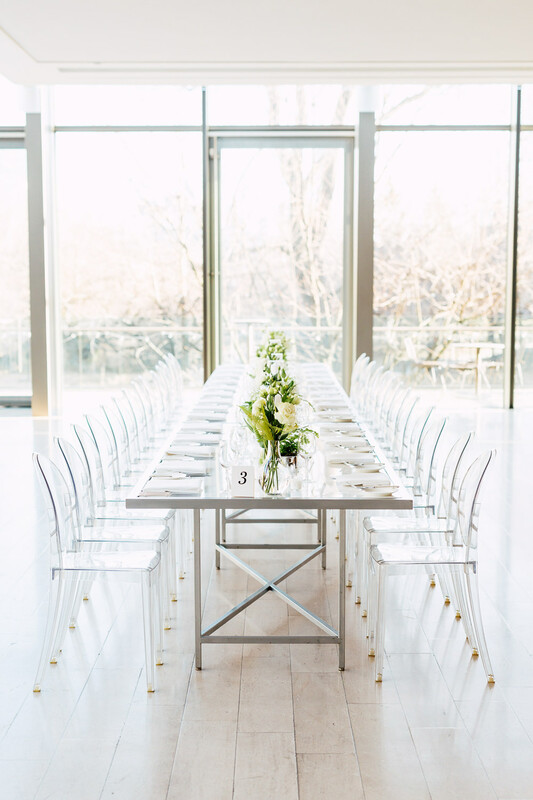 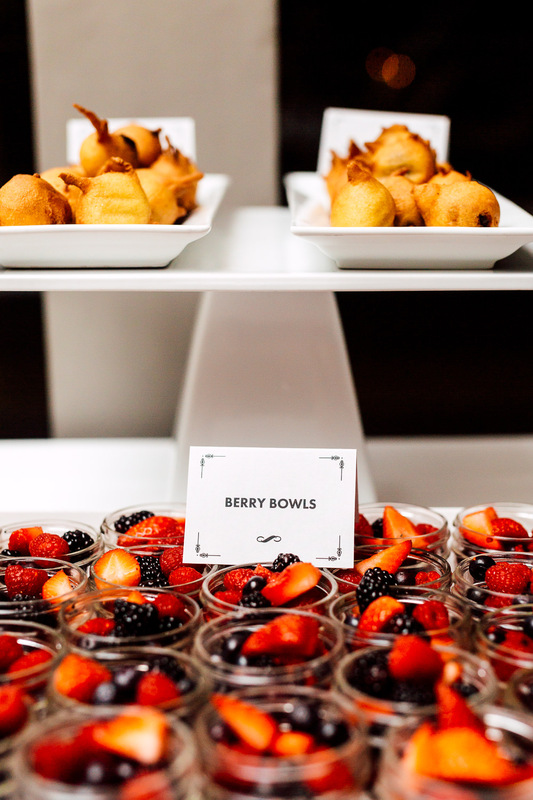 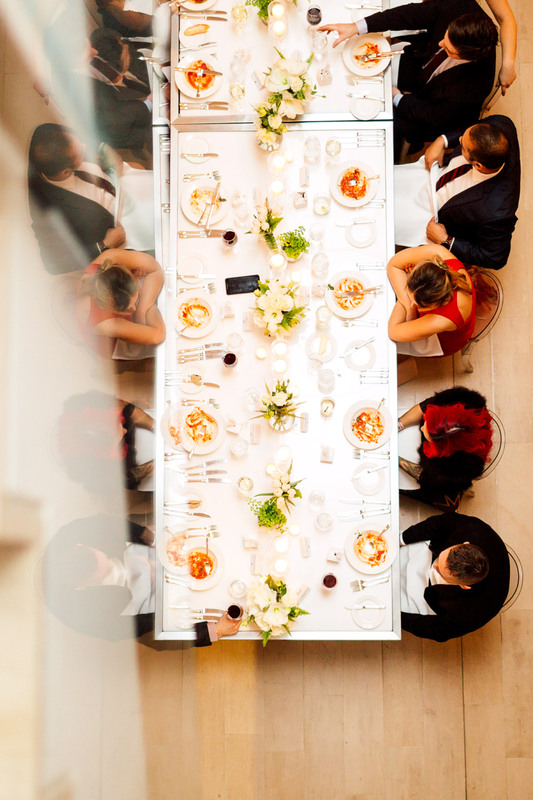 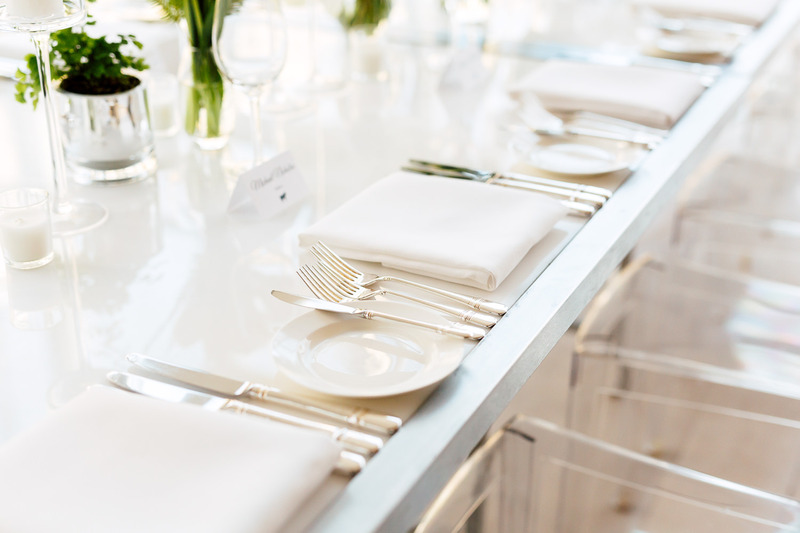 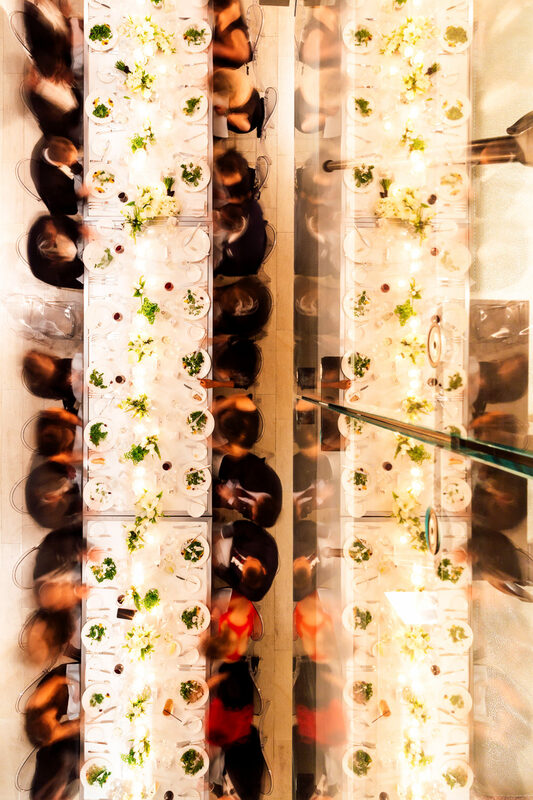 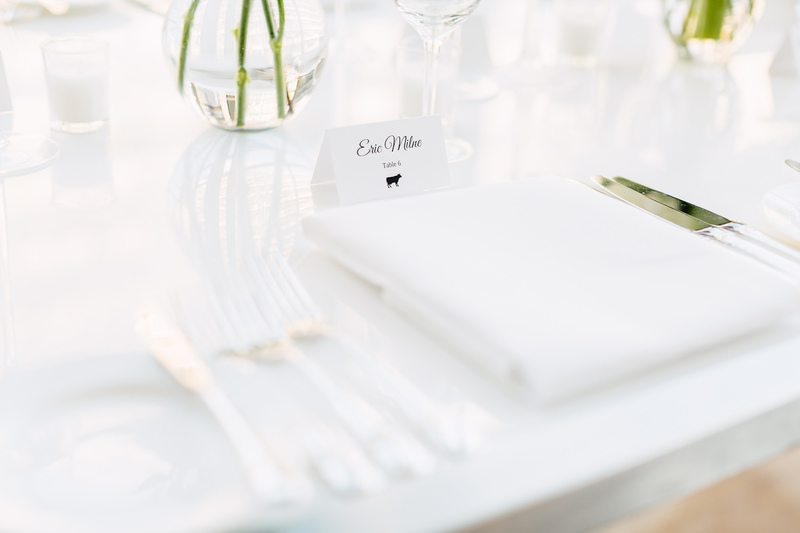 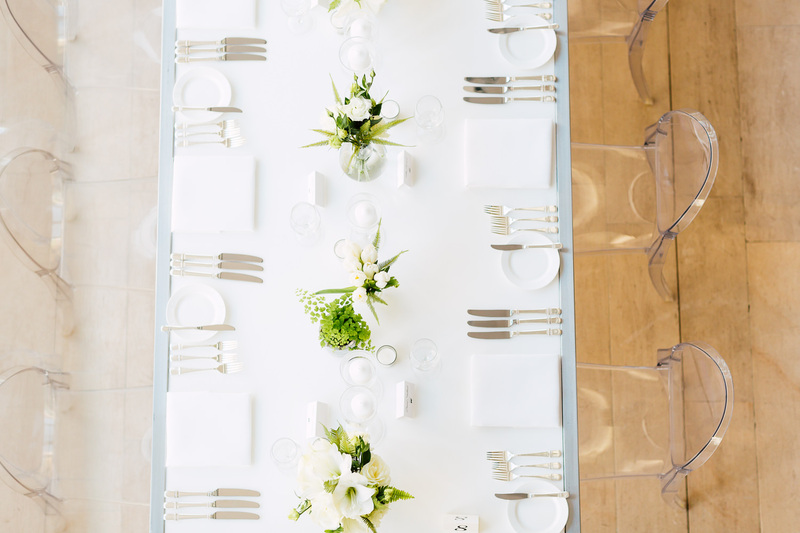 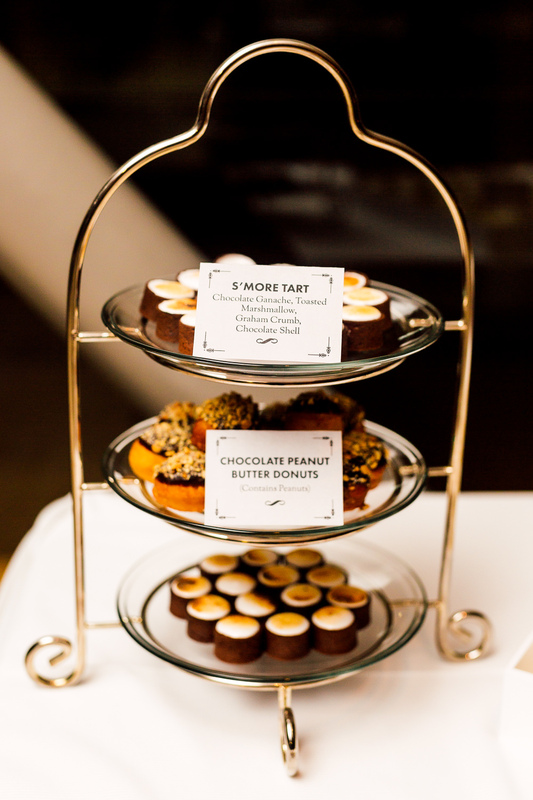 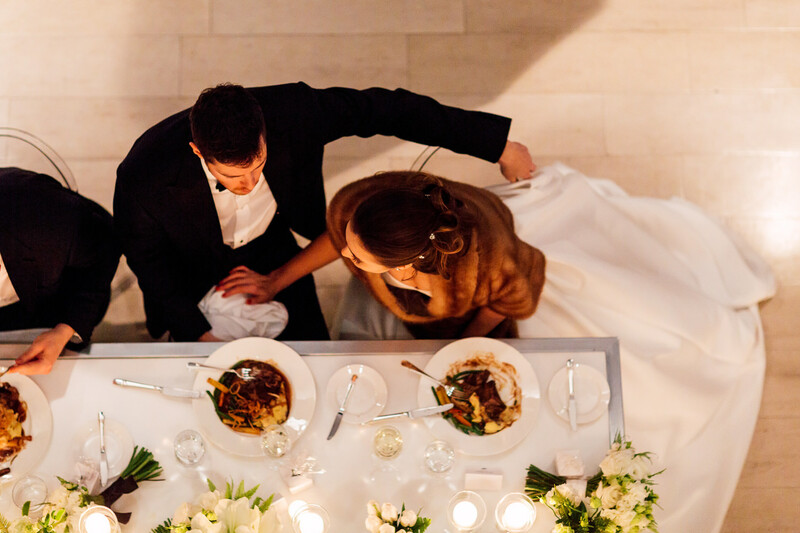 Although it’s a spacious venue, the reception still felt intimate with the long communal tables that fit 20 at a time! 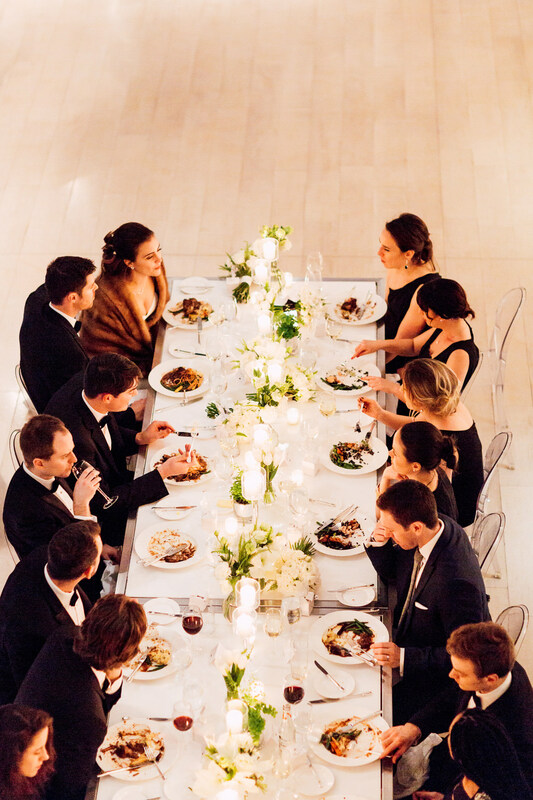 There was no need for a head table in the middle of it all. 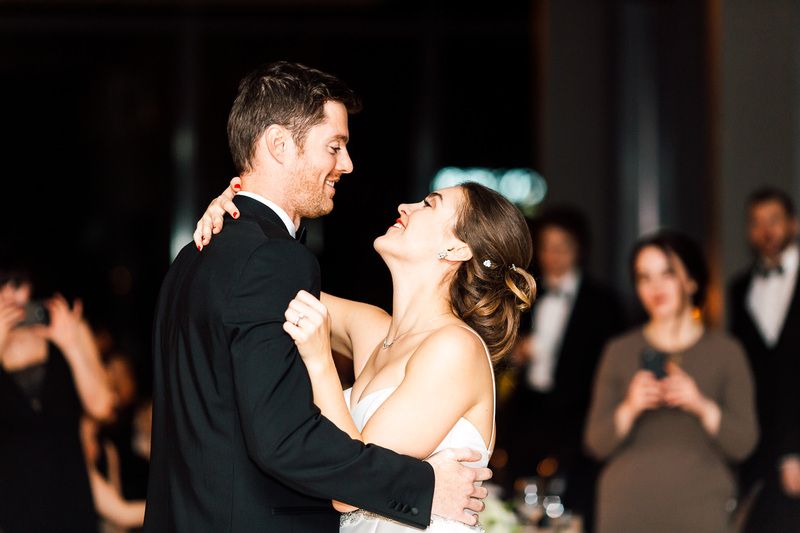 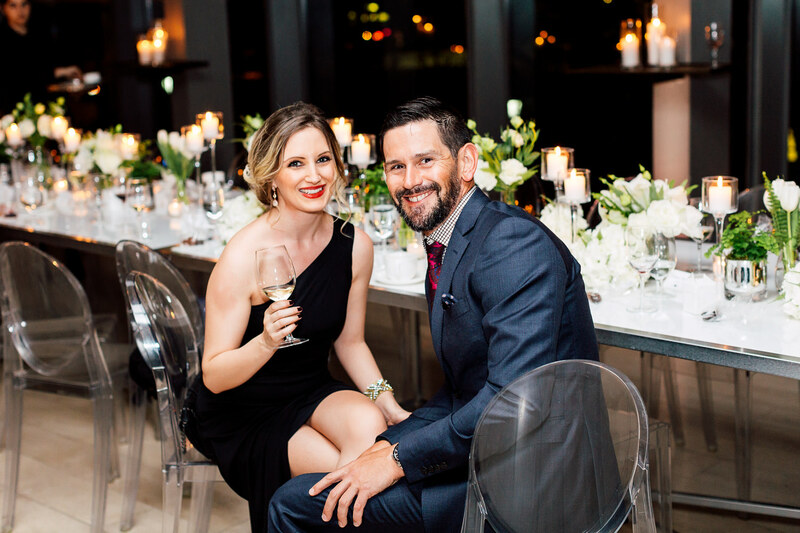 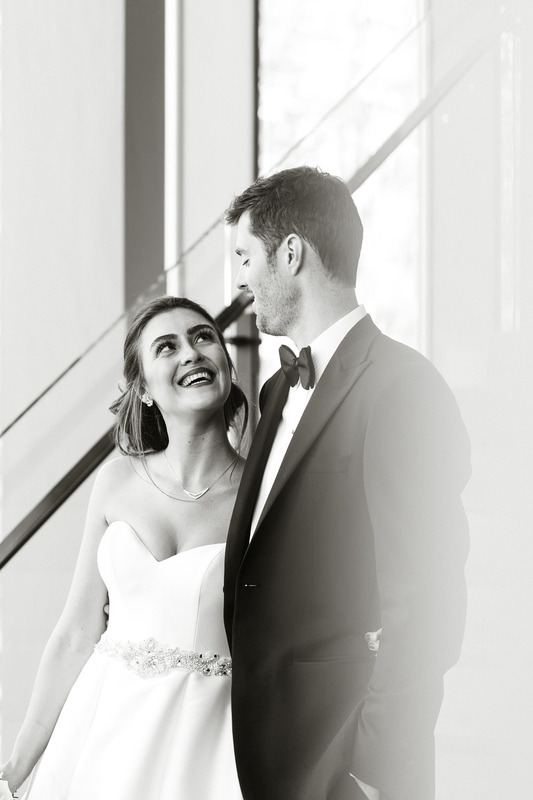 Erin and Fraser are the type to thrive when they immerse themselves with their loved ones. 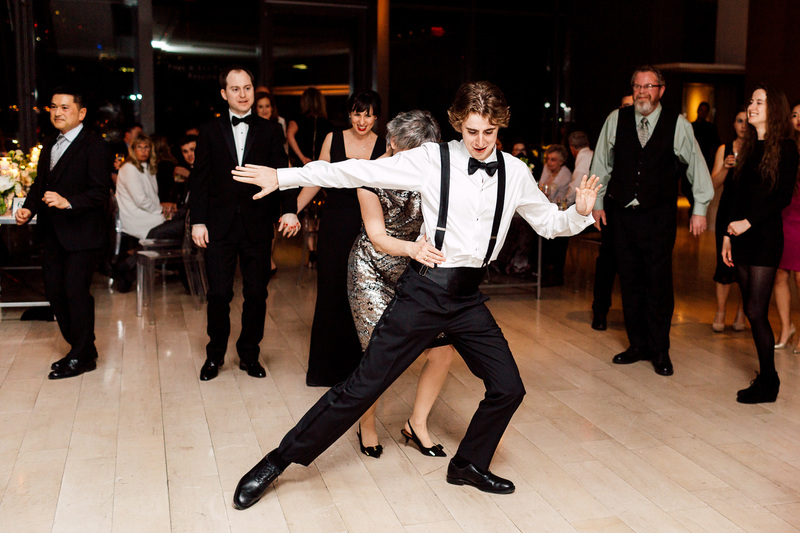 More importantly, there was so much room to dance! 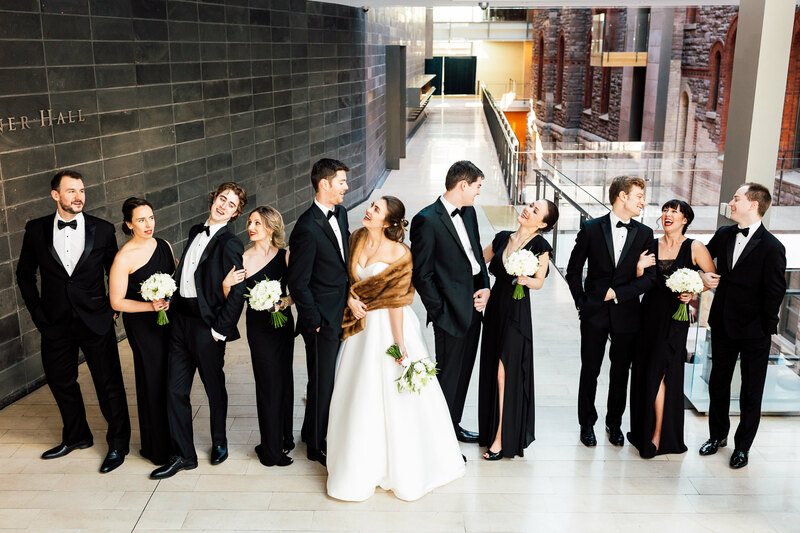 And that’s exactly where you found all the guests by end of the time, on their feet in celebration of Erin and Fraser’s love. 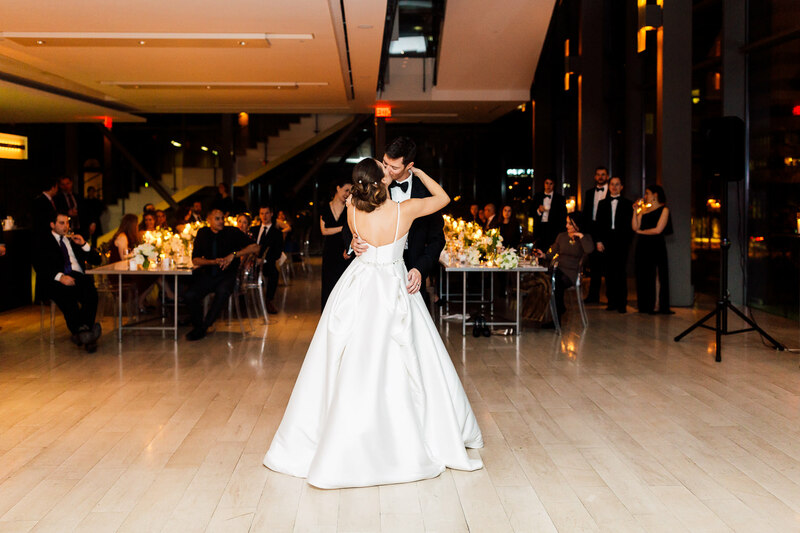 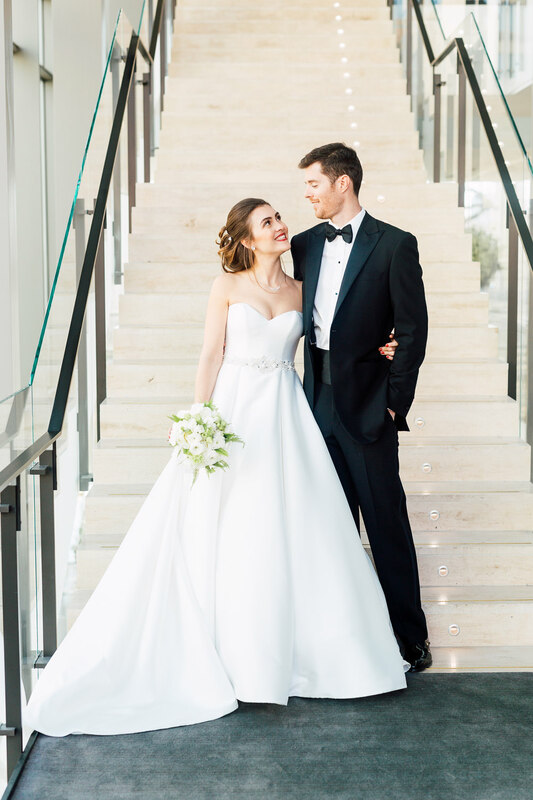 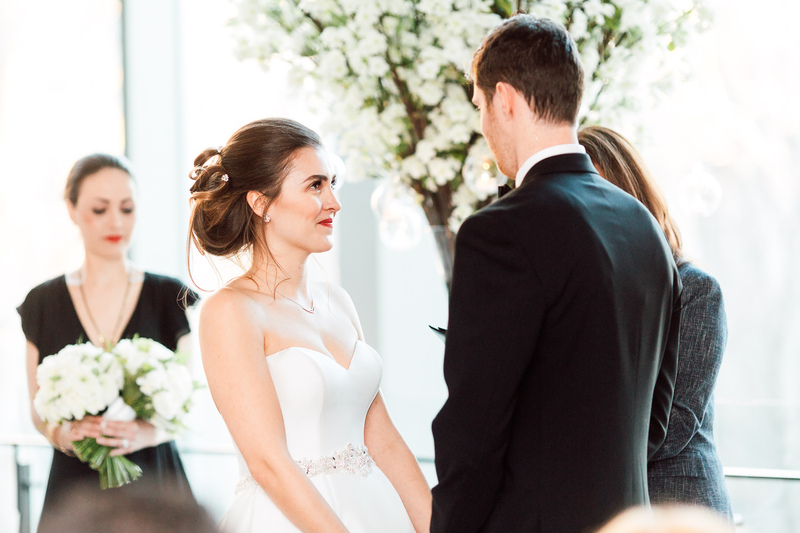 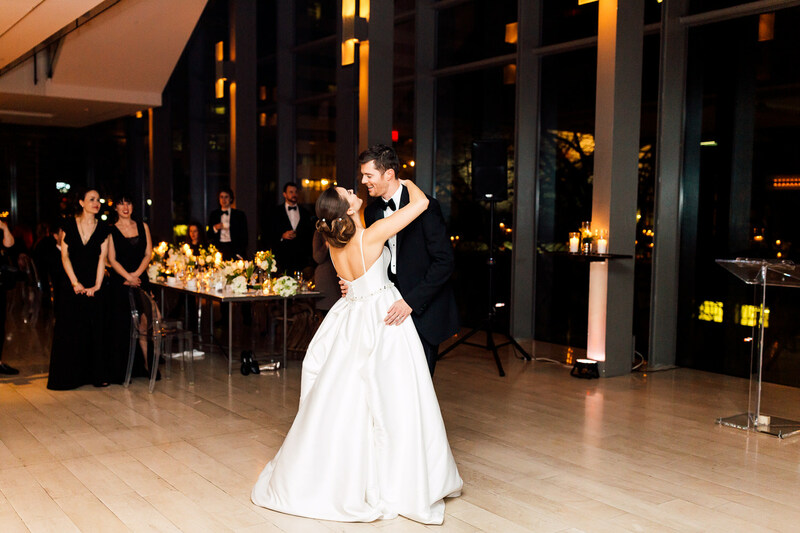 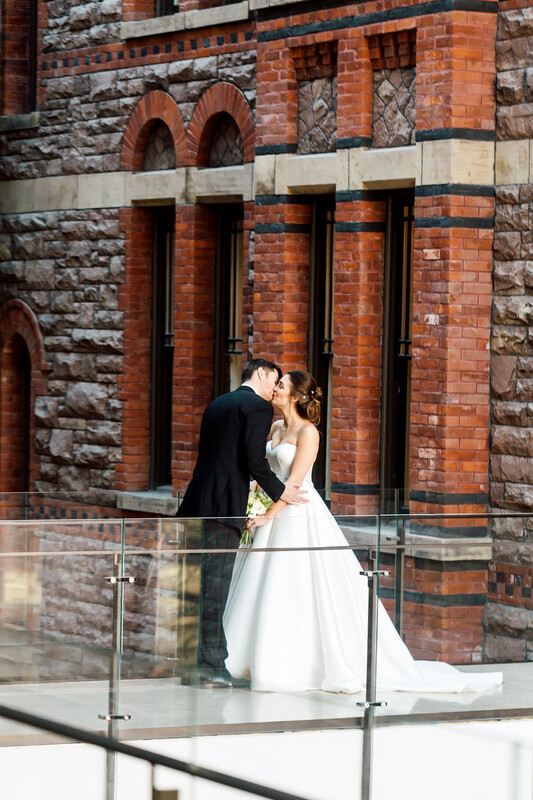 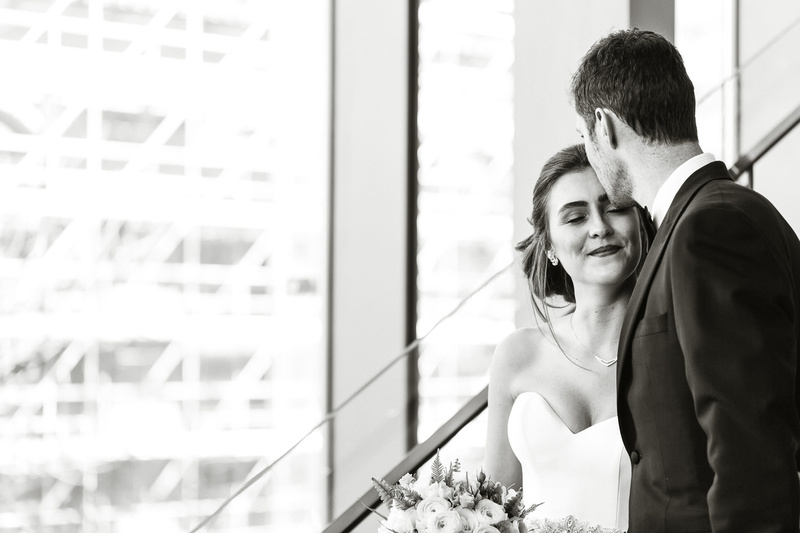 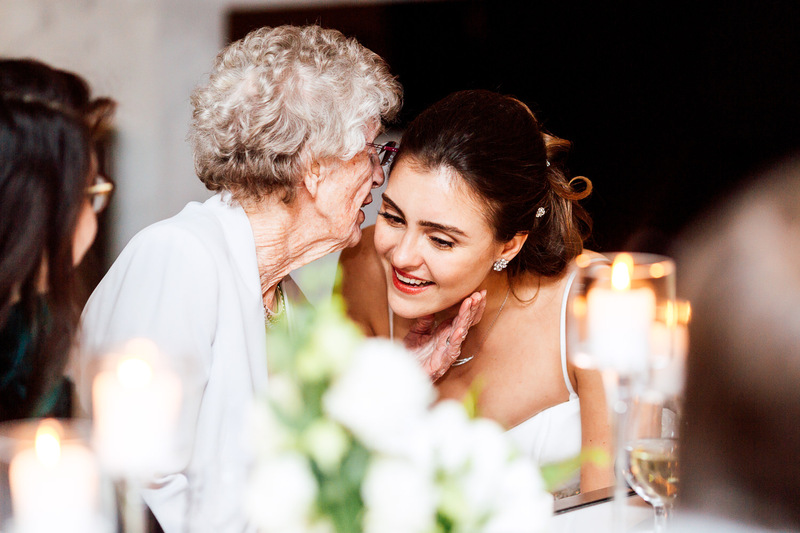 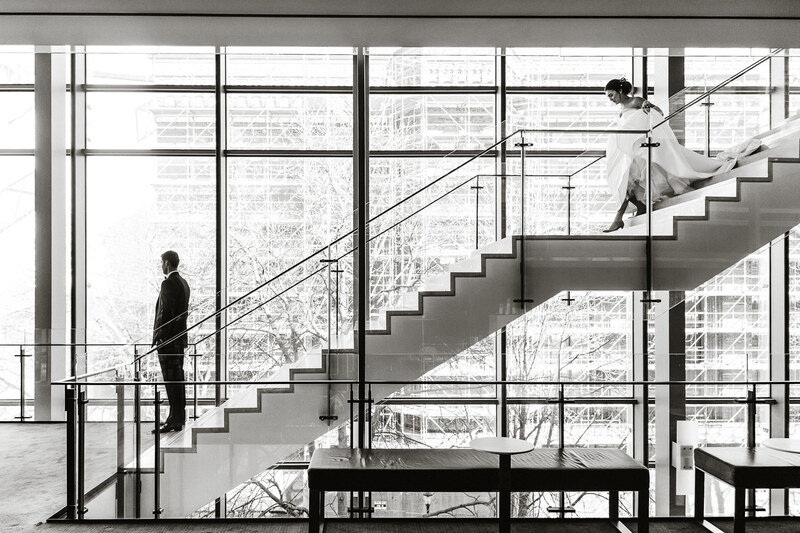 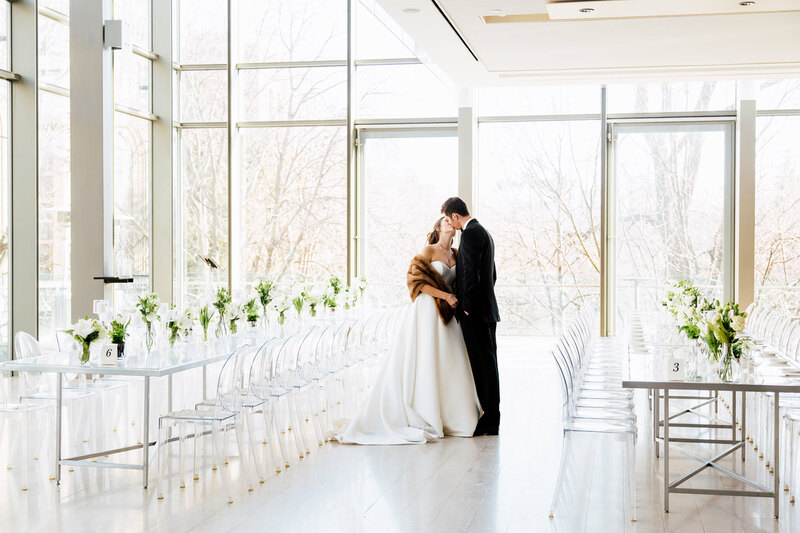 For a totally different Royal Conservatory of Music wedding vibe, check out Olessia and Anton’s celebration here.